Mr. Joe Burt’s home below Narroway Baptist Church along Murray branch across the road from the Baptizing Hole. This well served the church for nearly a hundred years. Kate is my Grandmother Marie Crew Tibbitts sister. Note. See post “The Bob – Montana ” before reading this post. After much anticipation and preparing, it was finely time to Go West. Todd and Toni picked me up at 5 AM on the morning of September 10th, 2015. We saw two doe deer on the way to pick up Keith. 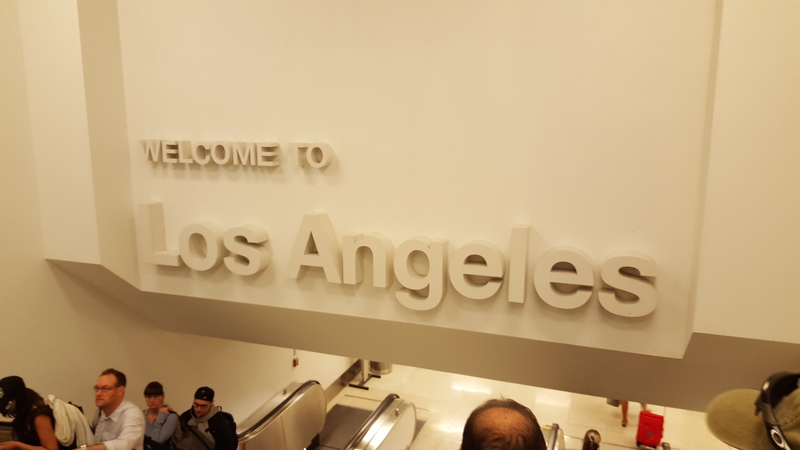 We arrived at the Atlanta Airport around 6 for our 8:10 flight to Los Angeles, California. We got through security and to our gate without delay. When boarding the plane, I noticed the gate attendant said “Highly Favored ” When asked “How are you?”. I thought that was a great response. Flight DL110 took off at 8:30 for its 4 hour and 5 minutes flight to LAX. I didn’t have a window seat and it was mostly cloudy so I couldn’t see much on the way out. In fact, I was in seat C of a plane that had window, seat A, seat B, Isle, seat C, seat D, seat E, isle, seat F, seat G, window. No one was in seat D, that gave me some room. 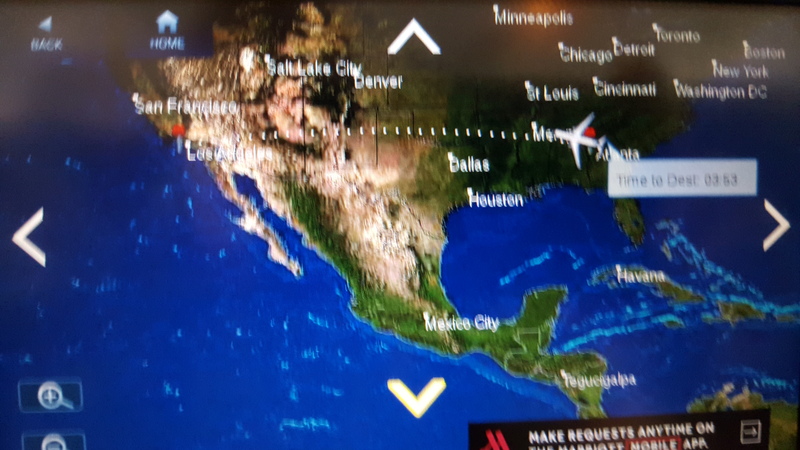 There was a monitor in the back of the seat in front of me that displayed our flight and what part of the country we were flying over. We landed at 9:35 Pacific time in sunny California and I got my first look at the Golden State. Yes, palm trees. After getting off the plane we had time to grab lunch at 10 o’clock. After lunch we didn’t have much of a wait before we got on our next flight. We stared boarding at 11:05 for our 11:45 flight. This time I did have a window seat on the left side of the plane. I enjoyed it very much. I think I have a photo of every inch we flew over from LA to Salt Lake. 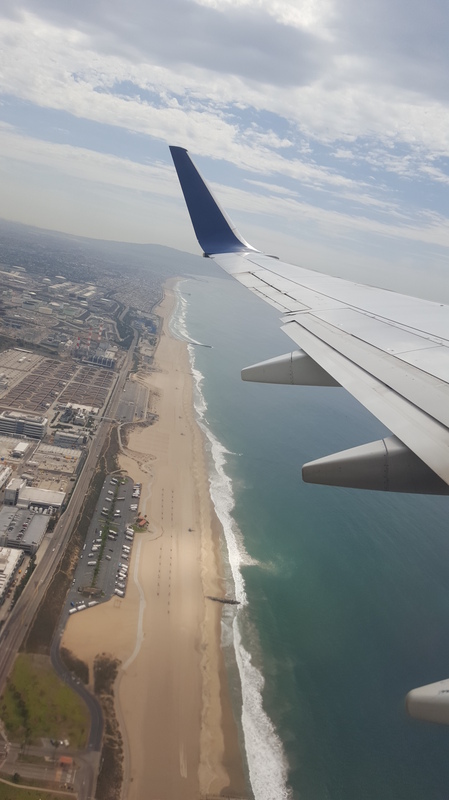 The airport is right on the coast, as we took off, we flew west out over the Pacific Ocean. I was looking south down the beach for my first view of the other Shining Sea. We made a big circle out over the water as we turned North East to Salt Lake. We could see a lot of the coast, boats, ships and the harbor. From the beach to the mountains was very densely populated. Not a very wide area. But, on the other side of the mountains, little to no evidence of man’s footprint could be seen from the air until we flew over Las Vegas, where we turned north to Salt Lake. The Landscape looked mostly desert and some mountains. I had never seen anything like it. I was taking a photo about ever minute. One thing that I noticed the most was the drainage of the land that was so evident. We flew over small towns, mountains and sand. Over Las Vegas, I could only see the North West urban sprawl and the Red Rock Mountains. From Vegas, the flight took a Northern course. I continually was amazed all the way to Salt Lake City. Just before landing, we could see salt flats and the world’s largest copper mine. After landing, it was a short lay over before we boarded a small airplane at 2:35 Mountain time for our last leg of the flight to Kalispell Montana. As we took off we could see the city of Salt Lake. I was not impressed. Once air born, we could see the Great Salt Lake. Again, I was disappointed. The water looked very uninviting. Soon, the flat desert gave way to mountains. Some snow was visible on the North slopes that were shaded. By chance we were on the plane with a man from Rome Georgia, just a few miles up the road from Dallas, where we live. His parents live next to the Bob and he was up to visit them. Our landing approach was over the flat head river. Very beautiful country. We meet Brett at the baggage claim of this very small airports. I have seen bigger truck stops. From the airport we could see the peaks of Glacier National Park. Todd Hunter arrived shortly to pick us up in his four door flat-bed Dodge truck. After handshakes and greetings, we drove the nearly two hours to Todd’s house just outside Eureka, Montana. He is only nine miles from the Canadian border, and you can see the Canadian Rockies very well from his home. It is a two story log cabin built in 1895. It has large windows with great views that were original to the design. Todd and his wife Sarah did all of the renovations themselves and it is very beautiful. They live on a large cattle farm where they help with the operation. A farrier was shoeing several of Todd and Sarah’s horses when we arrived. We saw tons of whitetail deer on the way in and a good many were in the alfalfa hay fields around Todd’s house. We took the side by side buggy out before dinner to see the farm and look at the deer. Todd had been seeing some Elk a few days before our arrival, but no luck this night. Sarah cooked a great meal of chicken and dumplings with zucchini squash. Todd and Sarah have a three year old daughter named Bella. She is a little cowgirl. She has her own pony, Biscuit, that she rides. She loves to ride her mother’s horse, Cisco, and can name all the other horses and mules. 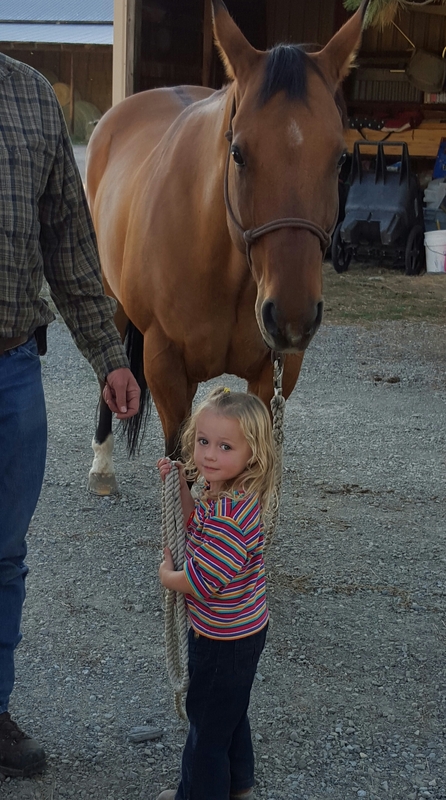 It’s amazing to see a little three year old girl lead a horse by herself. She will grow up to be a fine young lady someday. Todd and Sarah have two spare bedrooms. Keith took one and Todd Tibbitts and I took the other. Brett took the couch. Day two. September 11, 2015. I woke up at sunrise. Todd Hunter, Brett and Keith were up. Todd Tibbitts got up a little later. We all had a cup of coffee, and we were standing at the coral looking at the whitetail deer in the field. I had gone in the house to put my camera away, as i was coming back out, a huge Elk appeared on the ridge line behind Todd’s house. He was maybe 100 yards at most away from us. He was silhouetted against the morning sky. It would have been an award-winning photo. Field and Steams eat your heart out type of setting. I ran back inside to get my camera. When I got back outside, I saw him jump the fence at the bottom of the hill. He turned and headed away from us. I got a few shots of him as he trotted across the field, but he was a long way off. It was one of the biggest Elk Todd had seen on the farm. With binoculars we could see him cross the road about a mile away. After all the excitement, we all loaded up in Todd’s truck, Todd H, Sarah, Bell, Todd T, Brett, Keith and myself. We went to downtown Eureka to eat at Jacks Cafe. 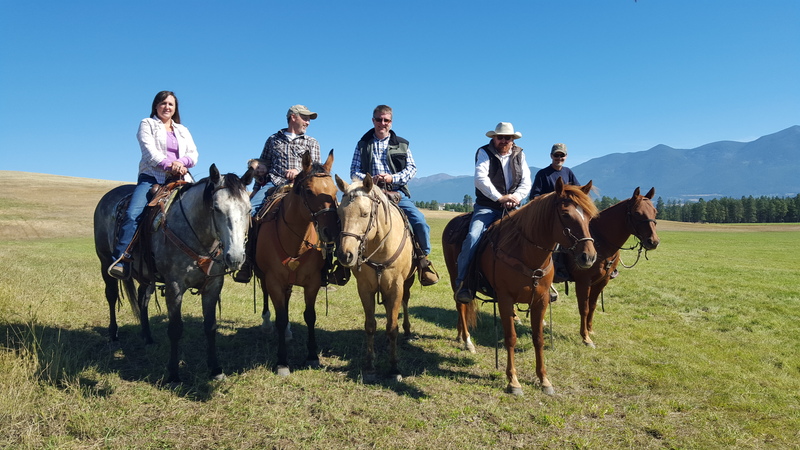 We came back to Todd’s house and saddled up five horses for a cattle drive. First we went down the road and meet Joe who runs the farm. 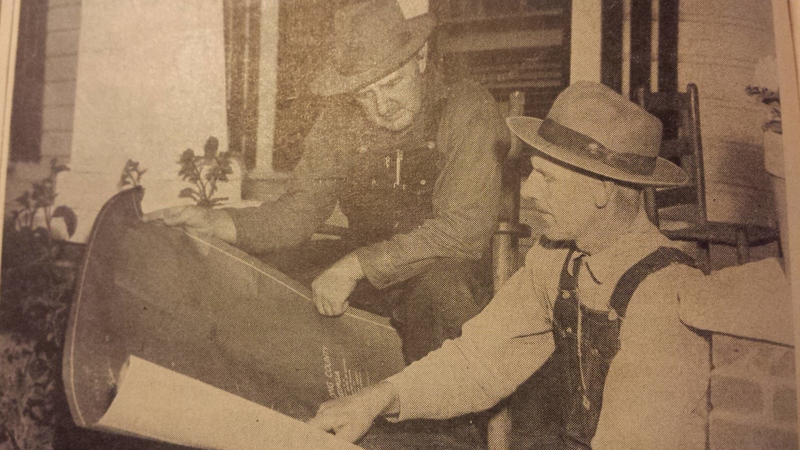 He was installing pipe for a center pivot irrigation system. We rode the horses down the road pass the hay barn. Sarah was on a 6 year old that she was training. Todd Hunter was on Cisco. Bell rode with him on the way out. Red was on a wild mair that Todd had borrowed for the trip. Brett was on his horse and I was on Little E. Todd Tibbitts and Keith rode the side by side buggy. They opened the gate for us and took Bell. We rode up a little hill to were the cattle were. The goal was to cut the bulls from the cows and drive the cows to a new pasture. Todd and Sarah cut each cow a we helped to block them from mixing back together. Once they were separated we drove the cows and calves down the hill and through the gate. The push across the field was nice and easy. We turned them down by the corn and out the gap to the road. Todd and Keith were waiting for us a little ways down the road. They had the gate open to the other field and the side by side buggy in the road to block the way and to turn the cows. After a successful cattle drive we had to go on another round-up. A yearling had gotten into a neighboring pasture. The pasture had a heard of Black Angus Cattle that was in the corner of the pasture. The yearling was along the fence next to the pasture he should have been in. We entered the field and had to pass the Black Angus to get to our calf. After we had passed them , they started to follow us. Sarah, Red and myself turned our horses to face the cattle, while Brett and Todd drove the calf to a small gate where Todd and Keith were waiting. Once the calf was in the other field, the Black Angus turned and headed back to their corner. We then rode over to the gate and joined everyone there. We had a quick ride back to the barn and put the horses away. After getting back and putting the horses away we loaded some things into the nose of the horse trailer. We then went to a little fishing village to eat dinner. We saw several Mule Deer roaming around town. In the morning we saw several cow elk on the other side of the pasture. We glassed them on our way to breakfast at Jack’s. When we got back there was another cow out. We herded this one with two side by sides. Once we got it back in the fence, we saw a coyote crossing the field close to where the elks were. We couldn’t get a shot off. We then packed several bales of hay into the trailer. Each one around 80 lbs. Up to this point we had not heard from Cameron, Todd H. friend who was to help pack us into the wilderness. The other dilemma were the wildfires. The areas we were wanting to go were still closed and we had no idea when or if they would be open. We checked the website each day for updates but our area remained closed while others were opened. We were itching to do something, so we decided to go to Cabelas. It is in Kalispell, over an hour away. We all bought fishing license and Todd, Keith and Brett bought their hunting license. We loaded up on fishing gear. I bought a box of bear load for the 44. I also bought a extra battery pack for the solar charger that I had borrowed from John. We then went back to Todd’s house to shot our guns. The hunters shot their rifles. I shot a few rounds of the bear load in the 44. After the target practice, Todd H walked to the hay barn about 80 yards down the field road. He Spotted a skunk and yelled for one of us to come kill it. I was elected and Randall handed me his pistol. We rode up on the side by side. By this time the skunk is in the field. I take aim and fire from just a few yards. I see a little blood splatter and I go to the skunk. Well, it keeps going. So, I shoot at it again and miss this time. It’s moving faster in the field so I run to get in front of it. I shot it a few more times. I know I am hitting it. I can see the lead lodged in its fur on its chest. It is bleeding from a few good shots but it is still going strong. I eventually unload the whole magazine, 8 to 10 rounds. Everyone is laughing at me from a safe distance. I didn’t know it at the time but the pistol was a .22. I thought it was a 9mm. I went back to the side by side and retrieved the 44. One shot of bear load stop the unstoppable skunk. I am not sure when I got sprayed, but I did. To me it wasn’t that bad, but everyone assured me that it was. I went to the barn and stripped down. My bag was still out there so I got a pair of house pants out and put those on. I hung all my clothes up to air out. The worst was my belt and wallet, that were leather. Keith had a bottle of scent blocker. I sprayed it on everything several times. I then took a shower and got 90% of the smell off. I was now dinner time, we left Todd H picking up hay and we went to Four Corners for dinner. We had decided to go to Cameron’s place so we would be ready to head into the Bob once it was open. We packed up our personal items before going back to Four Corners for breakfast. We finished packing up all of our gear and loaded the horses. We had two trucks and trailers. Todd Tibbitts, Keith, Brett and Red was in one. Sarah, Todd H, Bell and me in the other. We stopped for lunch, gas and groceries in White Fish. Then from Hungry Horse it was a 52 mile trip down a dirt road in the national forest to Cameron’s place, Wilderness Camp. Back in the 1960s, when the Flathead National Forest was founded, there were three sites for lodges sold. Cameron’s father bought one and named it the Wilderness Camp. It has maybe 15 little cabins and one lodge for gathering and dinner. He runs his hunting outfitter business from here. A little background on Cameron, he is in his early 60s I would guess. One would call him a drunk if they didn’t know him. Tough as nails. A big man that can more than hold his own. Before the fires, he had a tent setup in the woods where he sleep each night. The firefighters, when making a fire break, cleared all the trees around the camp and exposed his tent site. When we were in the wilderness, he would sleep on the ground each night by the fire. If he wasn’t cussing he wasn’t talking. He was a rough old mountain man but he was nothing but kind and he opened up his place to us . When we got here several fire fighters were staying in the cabins. As we were just setting up, a fire fighter drove up and talked to us a little. We then put the horses on a high line in an area of the camp that had been cleared by fire fighters just a few weeks before to help protect the Lodge from the wildfires. All but a very few scattered trees were cut. The high line is a rope that is hung about 6 or 7 feet off the ground from tree to tree. The horses are tied to it. Cameron had a large coral but we did not know when he would show up with his horses and did not want them in with his. The forestry service had Cameron to take his horses out of the forest and away from the fires. At first he did want to take them off but rather take them down to the lake in the delta like area where the river comes into it. We fished down there and it would have been a great place to protect the horses. The head ranger for this area is a lady and she had a meeting with Cameron where she offered a 5th of Jack Danielle if he would take the horses away. He took them to his father’s house. At this point in the trip we still have not heard a thing from Cameron and expected him at anytime. After feeding the horses, Red, Keith and myself walked down to the river at the bridge that was just a mile up the road. 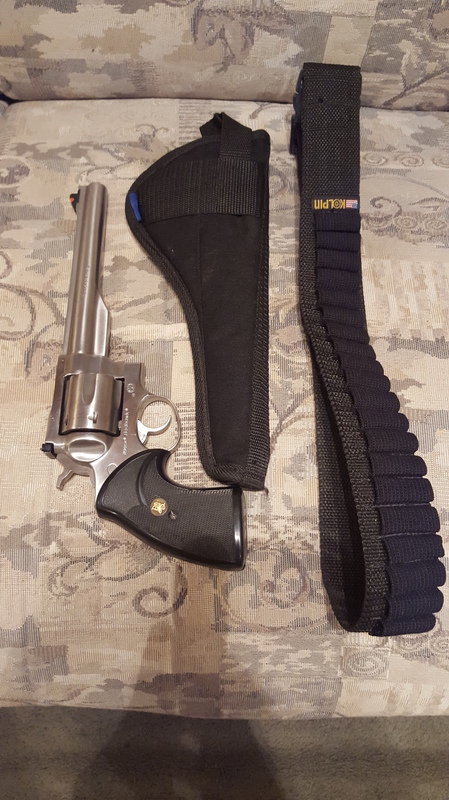 I had the big iron on my hip in case of a bear encounter. We walked around until about dark. Then headed back. We had made camp next to the coral and an old horse trailer that was on our East side. We put up a few tarps over a fire ring and setup the kitchen there. Brett and I hung our hammocks to the north of camp. Todd H. and family sleep in their horse trailer, Red, Keith and Todd sleep in Red’s trailer, south of camp. The high line horse were on the west side. We had a good dinner, some of the fire fighters joined us. We had guitar playing and singing by Todd T. And Red. The fire was good and warm as the night temps stared to drop. The Corral had water and we needed to water the horses before going to bed. We each took two at a time and walked them over to the corral. It was good a dark by this time. I still was not that familiar with handling the horses. I had a lead rope in each hand and was about half way to the corral when something spooked both horses and they both reared up pull my arms up and apart. I had to let go of one rope. I started yelling for help. The horses never started to run and I was able to grab the other lead rope. Help arrived and took one of the horses for me. It rained during the night but not to much. I was warm dry and happy in my hammock. We restarted the fire and had breakfast. This is when Dugan came up to met us. He works for Cameron packing horses. He is a young man in his 20’s, Tall and skinny. He really didn’t know where Cameron was either. We sat around the fire eating breakfast and getting to know Dugan. As we were talking he told us about his friends who are Blackfoot Indians that lived on the reservation not to far away. He told us about Indian days, kinda like the Indian Olympics. Apparently the reservation is a good place to buy horses. His Indian name is Dances with Pigs. He earned the name after his friends family were going to kill and cook a hog. They tried to do a ceremonial slaughter but they had difficulty killing the hog. With the hog wounded, screaming and running around. Dugan caught and killed the hog. As the wind would change the smoke would blow on someone else and they would move. That is when Dugan asked if we knew why Indians dance around the fire. Answer; to get out of the smoke. He got us on that one. We were ready for some inside Secret Indian knowledge. We would learn that Dugan was a hard worker and good at what he does. In fact he had been working for the forestry service packing in supplies for the fire fighters these past few weeks. After breakfast and feeding the horses, we explored the lodge. As you walk up there is a small porch with a bench against the wall. Big uncut lodge poles were used for the post. When you walk through the big heavy door you enter the dinning area. The end of the table is 8 feet from the door. You can sit about 20 people around the table. There is no electricity. A battery operated radio is playing. Someone had left Cameron a six-pack on the table. There are gas light s above the table and a few on the wall. To the right is a large kitchen. Next to the door on n the right was a desk that served as the office of the operation. To the left was a couch along the front wall. A wood burning stove was along the next wall and a big chair was in the corner with a book shelf behind it. The building was an upside-down”T” shape. On the one side was a bedroom, bathroom, living room then the dinning area with the kitchen on the other side. Past the table is a steep down to a landing just big enough for a couch on each side. Then it goes down one flat of steps. From the front door to the back wall is one long room. The back wall had a river rock fire-place. I am sure the whole place was built from material found on site. The back wall being two-story high was full of Elk, moss, deer and all kind of trophies. Didn’t look like much had changed in the past 50 years. Todd T and I joined Todd H, Sarah and Bell on a trip up to the Spotted Bear Ranger Station to try to get information about trail opening. It was only 2 miles up the road. We passed the two other outfitter camps. From what I could tell, I liked Cameron’s place better. 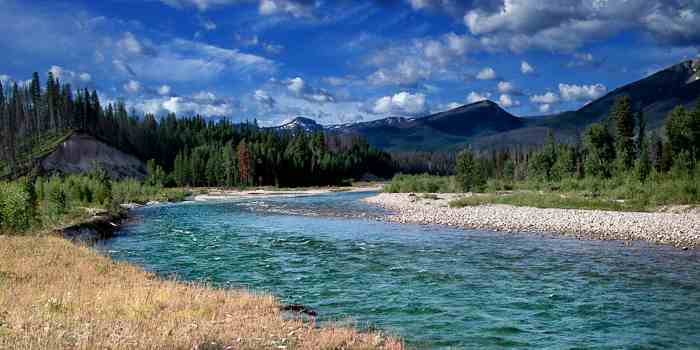 His is close to the Flathead River and they are next to the Spotted Bear River. A lot of fire fighting equipment was around. Each building and cabin was protected by a sprinkler system. The office was new and the old station looked as if it was being turned into a museum. We didn’t get much information. Where we were going the fire was out but the road and trail had to be cleared of dangerous trees. We seen a fire fighting airplane and a helicopter off and on. We spent most of the day fishing the river just above the lake. We drove down from camp, all in one truck. Some of us sat in the back. It was just four or five miles down the road. We passed the Spotted Bear Air Strip and the area that was currently being logged for timber. They were doing a great job of clean up. It was a heavy thinning operation but it was not clear cutting. All debris was picked up and moved to one location. We passed or was passed by logging trucks often. They tried to make two loads a day. One trip was over hundred miles just inside the National Forest. No one had any luck fishing. I spent my time talking photos and exploring. Where the river meets the lake it is a large flat grassy delta. Cameron’s horses would have been very safe here if this area had burned. We did see moss tracks in the mud. On the way back, close to sunset, we stopped at several area overlooking the river where we could see the mountain sides. We searched each one for Elk. We passed the airstrip right at dark and saw a few whitetail deer. Back at camp we had another outstanding dinner. I think we had hamburgers. A few of the fire fighters joined us again and we enjoyed Red and Todd playing and singing. I am sure we watered and feed the horses at some point. I explored taking time laps photos of the stars. After Breakfast, we set up a electric fence to keep our horses in so they would not be in the same coral as Cameron’s horses. It was a team effort, everyone had a job. The location that was chosen was in an area next to camp that had just been cleared as a fire break. 95% of the trees had been cut but there were just enough left that we could use them as fence post. A small stream was close by and we incorporated it inside the coral. That would keep us from having to water the horses. The fence consisted of two wires that were attached to the trees with insulators that we screwed into the trees. It was electrified with a battery. Then Cameron showed up with a load of hey. We all started to help unload the 80 lb bales on to a large stack of hey that was already there that was keep under a tarp. We all got introduced to Cameron. We then unloaded all of the pack saddles that he had taken with him due to the threat of the fire. Todd T. Brett and myself decided to hike up the mountain behind the Lodge. The trail was Stony Hill Trail. We were hunting Western Rocky Mountain Rough Grouse. Cameron loaned us his .22 rifle and Todd H. his .22 pistol. We took a lunch and stopped about halfway up where there was a great view of Silvertip Mountain. We continued on up the trail but did not summit. One the way back down and close to the bottom we spotted several Grouse. Todd shot at them several times with the rifle and missed each time. He then pulled the pistol and killed one Grouse. We hunted the cut timber between the base of the mountain and the road back to camp. When we got back to camp, we did some practice shooting with Cameron’s rifle. Turns out it was shooting way to the right, about one foot at 30 yards. I mean it was way off. We learned to adjust our aim. Todd showed Brett and I how to clean the Grouse by standing on its wings and pulling its legs back towards the head to remove the breast meat. Todd then cooked it over the fire. It tasted very good. While we were hunting, everyone else went fishing. We had another campfire dinner. Life was really slowing down for me. Todd H., Sarah, Bell, and Red went with Cameron back to his dad’s house in Hungry Horse to get Cameron’s Stock. Todd T., Keith, Brett and Myself went back to Colombia Fall to get more supplies and to change our flights to a later day because the fires had keep us out of the wilderness. On the 52 mile dirt road in the national forest we saw a lot of Whitetail Deer. On the way back in we saw a Black Bear and her two cubs. We moved Todd’s stock from the coral to the hot wire that we had put up the day before. It was the first time that I caught and bridled a horse on my own. What you do is ease up to the horse and lay the long end of the rope over the neck of the horse. He then thinks he is caught. On the more tamed ones you could then slide the bridal over their head and buckle or tie it. On the more wild horses, I would hold the rode around their neck with one hand while putting on the bridal with the other. Cameron and Todd showed up late in the afternoon with Cameron’s stock. You could tell they were happy to be back home. We had dinner in the Lodge and a big fire in the fire ring at the pavilion in-front of the lodge. More singing and star gazing. A little bit of snow was falling on the mountain top. The morning low was 25 degrees. Remember, we are camping. This was our fourth night sleeping outside. Me and Brett were in Hammocks. Todd H, Sarah, Bell were in one horse trailer and Red, Todd T and Keith were in another. Some of the guys got up early and went riding the roads looking for bear. Some of them had a bear tag. Later on after breakfast we rode up to the trail head that we would be taking into the wilderness. It was the first time we saw where the wildfires had been. We saw the parking area and the temporary corals they have there. On the way I shot a Grouse with the .22 rifle of Cameron’s. I aimed about a foot to the left and killed it. It was Todd T. birthday. We had his birthday dinner in the lodge and like on his last trip, Sarah made him a birthday cobbler in the dutch oven. Mule shoeing day. Todd had his stock shoed on the day we arrived. The young man that did it was very good. The same guy came out to Cameron’s to shoe his horses and mules. He also shoes the National Park’s horses. He did the horses with out any problems out in a grassy area just out side of the coral. The mules were a different story. Cameron had build a stale he called the Iron Maiden out of 6 inch steal pipe, with 4 or 5 pipes on each side about a foot apart. It stood about 6 feet high. One the front was a wall of 2 x 12 boards just as high. Each leg of the Mule was tied tight to the steal pipes. The Mules would buck up and slam their heads against the boards and knock themselves silly and buckle their legs. It was a fight for the young man to shoe those Mules. Most of the day was spent tending to the livestock. After all of Cameron’s stock had new shoes. He and Dugan carried them up to the corals at the trail head. We moved Todd’s Stock back into Cameron’s coral and took down the hot wire. We learned that Cameron had shot at a bear on his way up to the trail head. We packed up camp. I took a shower for the first time in a week. We had ribs for dinner and we all stayed in some of Cameron’s cabins for the night. We were up before the sun. Loaded the stock into the trailers and was at the trail head at daybreak. Cameron and Dugan were already well on their way packing their stock. They would go ahead of us. Dugan led a 10 mule train. It took us another hour or so to get packed. We had 6 riders and 4 pack mules in our group. It was a 16 mile ride into camp. It took all day. I was on a mule called Hot Sauce. With this fire and other fires a lot to trees were down. So many, that the trail cleaning crews only cut up the ones that could not be crossed by the mules and horses. In the wilderness, not gas powered tools are allowed, that means no chain saws, only hand cross cut saws. So that keep a lot of down trees from being cut too. As we came to down trees, my mule would jump the logs instead of stepping over them. I lost my hat twice. I final figured out how to pull back on the reins enough to keep him from jumping. We got on the trail at 10:30 and got to camp at 4:15. We had not gone very far when one of the pack mules was biting at another and it bucked, losing it’s load. This is called a wreak. We had to stop and repack. Sarah carried Bell the whole way in. We lost Red at the trail head. He could not make the ride in with us. We saw a little doe deer at the trail head and a few Grouse on the trip in. We rode by mountain top cliffs and through areas that had burned in years past. We followed the Spotted Bear River up and had several stream crossings. When we got to camp, an area the National Parks has designated for outfitter to camp. Each outfitter has there own locations. This is a very nice area along the Spotted Bear river. There is a large meadow and we camp on the east end. Dugan has unloaded Cameron’s mules and is headed back to the truck with most of the stock for more supplies. He had a 32 mile ride that day. Most of what we pack in is hey for the stock. During the off season every thing must be disassembled. We are the first group in, so we have to reassemble the camp. First order is the coral. Lodge poles are used for fence railing and hay bale string is used to tie them to the trees. The poles are in place around the coral, all we have to do is pick them up and tie them to the trees. In just a few minutes we have built a coral. We put Todd’s stock into the coral and Cameron ties his horse up and lets his mules roam free. The horse is the leader and the mules will not leave it. Plus the mule will keep the bears away. Cameron’s mules are huge. They were breed from Belgium Horses. Everyone is dead tired, it has been along day. We just do hamburgers for dinner. Brett and I find a place for our hammocks, Todd and Sarah put up a Tee Pee tent, and Todd T. and Keith set up a lean-to. That evening, two guys come into camp. They are friends of Cameron’s. One of the guys named Lawrence had killed a 5X5 Bull Elk. We all enjoyed seeing his trophy and hearing about the hunt. It was opening day and the first kill of the season. We also had fresh meat in the camp. The Elk meat was hung on a pole to air out and covered with a pack mantie. Time to watch for bears. I sleep to 9 AM. Todd and Brett had taken the advice of Cameron and went out Elk hunting on Pivot Mountain. The two hunters who had came into camp had gone to the continental divide to Goat hunt. After a banana for breakfast we took the stock down to the river for water. Keith, Todd H. and I set up the big Cooking Tent. No one sleep in it. We only used it for the kitchen. It would have be a shelter if we had gotten bad weather. Cameron would use it for the rest of the hunting season. Like the coral, the poles were left behind, we just had to figure out he right combination. 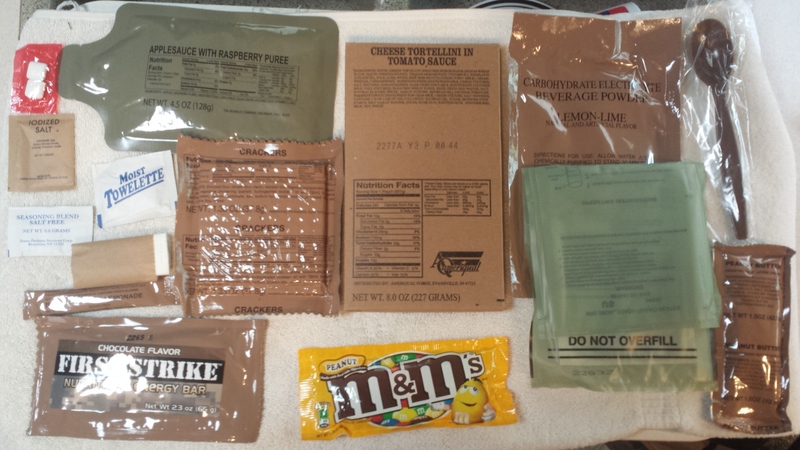 I had one of my MREs for lunch. I had been sleeping on Keith’s air mat and he was on mine while they camped on the hey in the horse trailer. It had started going flat on him so I swapped back. His was nice and conferrable. We cut wood for fire wood with a cross cut saw. We put up a high line for the horses if needed. We worked on Keith and Todd’s lean-to tarp some more. We cut brush to put around it to help block the wind and placed a pole under the tarp to help hold it up. I heard a gun shot around 4:40 and 5:30 in the direction that Todd and Brett were hunting. We had fresh Elk steaks for dinner from Lawrence’s Elk. The term “It’s Getting Western” started to get kicked around. Todd and Brett came in after dark with the story of how Brett killed an Elk. Then the two other hunters came in with their kill of a Goat. In Brett’s excrement of telling his Elk story, he triggered his bear pepper spray in his pants. Everyone scattered when they heard the can go off. I think Brett took a dip in the river. We had high winds all night long and we keep hearing trees fall. We knew the trail would be a mess for Dugan who was bringing in more supplies the next day. We were all up early to go pack out Brett’s Elk on Pivot Mountain. We were on the trail by 9:30. We took one of Todd’s Mules that he had borrowed from his boss and left the other on a high line at camp. It was a two and half hour horseback ride to the top of Pivot mountain. We ate lunch at the summit. It was just a little walk to an area where you could look north into Glacier National Park a 30 miles away. After lunch, we hiked down the side of the mountain for an hour. That tells me it was about 3 miles away to Brett’s Elk. It took two hours to dress it. Then it took two hours to hike the meat back to the the horses on the top of the mountain. We all were packing about 50 lbs. Except Sarah, she had been carrying Bell the whole trip. We packed the mule with the Elk meat and head. It was another two and half hour ride to camp. The last hour was in the dark. The Horses knew the way. We rode with out lights. When we got back to camp from a long day of riding and hiking. We unloaded the horses and mules. We put them in the coral for the night. The stock we had with us drank water when we crossed the river at camp. Todd H and Keith went to water the stock that had stayed back. This is when we learned of the first fatality of the trip. Todd’s bosses wife prized mule that he had to basically beg to take with us, had died. The Mule is dead. It just got Western. Several things led to its death. First it had a halter on that is like a choke chain. Used in pack trains to keep mules moving. If the mule stops, the lead rope will pull on the halter and will close the mule’s air way, making the mule move on. Second, the mule was tied to a high line. Third, the mule stared going wild when we left with the horses and the other mules. It started pawing the ground and acting up. Forth, Cameron wanted to stop the mule from pawing. So he tied one of the legs of the mule up. At some point the mule fell on the ground, cut off his air supple, could not get up on three legs and died. Nothing like a death to put a depressing mode on the camp. I sleep late dreading the deed of removing the dead Mule. I believe the proper thing to do is to notify the park ranger and have them come in and blow up the caucus so bears will not get to it and develop a taste for stock. Cameron is not the type to call in the park rangers. They get along but I think they leave him alone and he leaves them alone. I didn’t know what we were going to have to do. I didn’t want to have to gut a mule and quarter it up to remove it. Then there are the bears to worry about. We had a breakfast of fresh elk tenderloin from Brett’s Elk, before removing the mule. What we did was to take a rope and tie it to the mules neck and then we used Cameron’s big horse to pull it father into the woods. We also tied ropes to the mules front legs and we help to pull. We tried to get it away from camp, because we knew in a few days it would begin to smell. I took a “bath” in the river with wet wipes. I got in but it was to cold to wet my head. Sarah fixed a pot roast in the dutch oven and let it cook all day. We saddled up and went down river a few miles below the falls to fish. Because no fish could get above the falls. The trail was littered with down trees from the wind storm. We saw where Dugan had cut his way through. He said he ran out of gas in the chain saw before he go to the Wilderness. It took him almost twice as long because of the down trees. Cutthroat Trout was what we were fishing for. We did not have any luck. Back at the camp Todd T, Brett and myself were preparing for a trip up to the Continental Divide for a overnight Mule Deer Hunt. We would spike camp just below the divide. Cameron lead Todd T, Brett and myself up into the Hart Basin and on to Hart lake. Base camp was at 4800 feet about sea level and Hart lake is at 5700 feet. It was a three mile ride. We passed an area on the trail that Cameron told us to be on the look out of Grizzles. It was the spot that Lawrence had killed his Elk just 4 days ago. We were too late, the Bears had already taken the carcass away. Only a few Ravens flew up as we passed by. The natural lake is feed by snow melt and was close to being dry when we arrived. It is the only water for miles. We brought our own water to drink but the stock needed water. We dismounted and walked them out to the water. We passed several sets of Grizzle Bear tracks in the mud. After Cameron showed us the trail-head for the top of the Divide was, he left us in the wild and headed back down tail to camp. We watered the stock and rode on up the trail. After leaving the lake, we starting riding through areas that had burned in just the past few days. As we got higher the view got even more fantastic. We were reaching 6500 feet above sea level and was looking for a place to make camp. Once above about 6500 feet the trees started to thin out and more large alpine meadows appeared. We found a spot we liked in the shadow of Table Mountain. We could tie up the stock and make a lean-to shelter in a few trees. After we got the shelter up, we took a little nap before a afternoon hunt just up from camp. We each took a section of the hillside meadow. I watched a coyote work his way up the draw. Very Western and Wild. Last Two Photos are not mine. With the fires and all the trees being conifers, it was hard to find fire wood. We were also a little concerned with starting a wildfire of our own. We found a hole where a stump had burned out and made our fire pit in it. For dinner we had brought fresh Elk steaks from Brett’s Elk. It had gotten dark on us while hunting. We had the fire going good. I had cooked steaks over open fires before but like I said earlier there was very little wood and finding forked sticks to support the steaks was impossible. We decide to cook over hot coals. The way the stump burned where we had our fire, there was a small ditch where a root once had been. We drug hot coal into it. We then made a grill from small dry sticks by laying them over the coals and the steak on top. It worked and I have used that idea on trip since then. We had a few Doe Mule Deer that came around the camp that night and I took a lot of night photo with my SLR camera. I was able to take a lot of really nice shots. It was going to be cold and we went light on the supplies. No one had a sleeping bag. 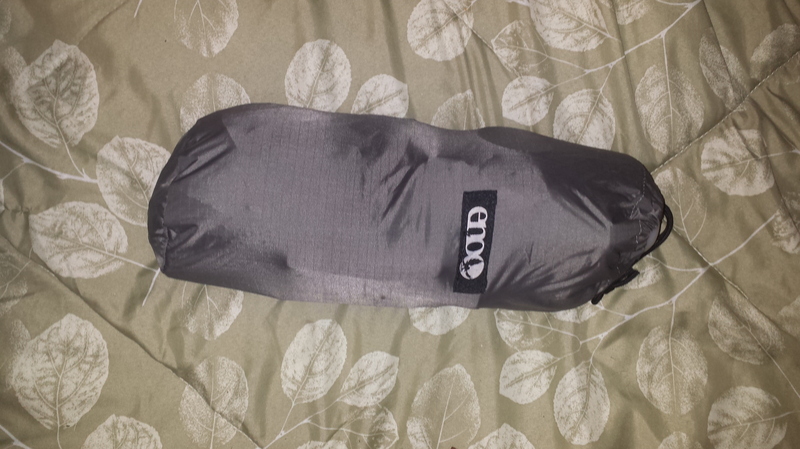 I did bring my sleeping bag insert made of silk. Not much but glad I had it. Brett and Todd didn’t want the fire to close to the tent. I think they regretted that decision by morning. We sleep on top of the saddle blankets for a insulator from the cold ground. I don’t know how cold it got, but deferentially the coldest I have ever been while sleeping. I just turned on my stomach and pulled my arms in and prayed for sun up. Todd and Brett headed out at just before day break hunting Mule Deer. I stayed back and grazed the stock around camp. I would keep moving them from one small patch of grass to another. Keeping them untangled from there lead ropes was another chore. While I was breaking camp and tending to the stock, several Mule Deer came in and around camp. Two fauns nursed near by. Then a young buck spared with a more mature buck. I could have easily shot the big buck. I didn’t for several reasons, one being I didn’t have a tag, I also didn’t want to disturb Todd’s and Brett’s hunt, and I didn’t want to have to deal with it. After the Mule Deer moved on and the horses were feed, I took a pack and hiked up to the Continental Divide. Our camp was at 6800 feet and about a mile from the Divide. We were about 1500 feet in elevation lower than the divide. The highest peak I got to was just over 8300 feet. I had never hiked in this high of elevation before. 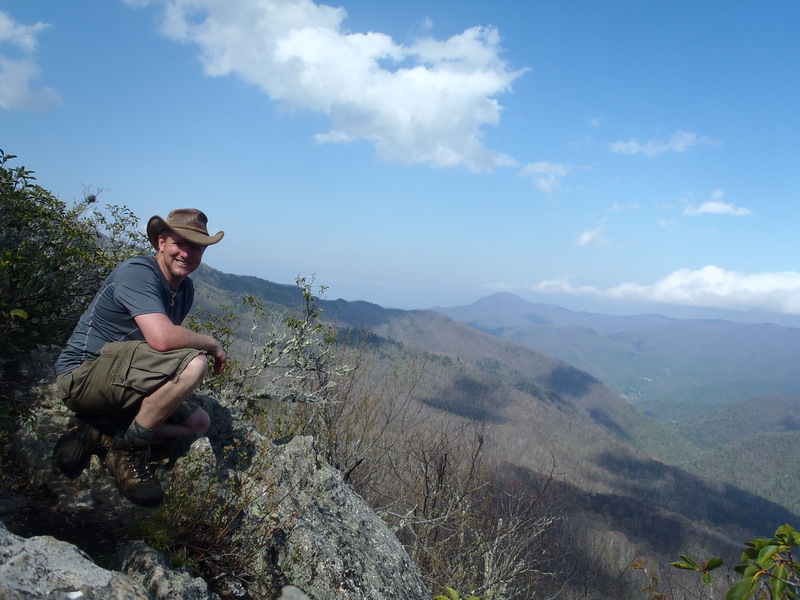 Quite different than the 5000 to 6000 feet summits of the Appalachian Mountains back east. From the camp to the summit was a 45 degree slop, very steep. It was one of the most strangest landscapes that I have every been on. Running horizontal were mounds of loose rock. One the uphill side of these 15 to 20 feet high mounds were deep ditches. Then a patch of trees. This repeated several times. Once I was passed the last group of trees, it was bear rock and low grass to the top. All I could see in front of me was this slop and sky. I had know idea what was waiting on me at the top. If every I had a view take my breath a way, this was it. Imagine walking for up and not knowing one moment and then the next seeing the view in the above photo all at once. It fells your whole area of sight at once. I was on the edge of a 1200 foot cliff. Lake Levale was Glacier Blue below me. Strait ahead was 20 miles of mountains in the Lewis and Clark Nation Forest. To the left and north 30 miles away was the high peaks of Gracie National Park. To the right and south was the Great Chinese Wall. In the shadows and crevices of the wall was patches of snow that had lasted the summer. Totally amazing. I ate my MRE for lunch. As far as I could tell I was the only person on earth. During lunch, I saw a few Grouse. I then walked to a high point the jutted out along the Chinese wall. I was about half way there and realized I had forgot my phone. I had to turn back to find it. I was able to make it to the very high point. What a grand sight. The last Three Photos are not mine. Not wanting to go back but knowing I needed to hike back to camp to check on the stock and see if Todd and Brett were back, I left my Rocky Mountain High. It was more of the strange landscape on the way down. On the way up I was hiking at an angle so not to go strait up the steep slop. Now I was making a strait shot to camp. My loop hike was about 3 miles total. When I got back to camp, Todd and Brett were there packing up. They did not see any Mule Deer but did see four mountain goats in the same area I was in. I told them about the camp deer and they both said I should have shot the big buck. Not what I was there for. We saddled up and made the easy 5 or 6 mile ride back to camp. The rest of the crew had been fishing and had a lot of luck catching Cutthroat Trout. We had fish for dinner. A little about Bell. She is 3 years old and went everywhere we did. She was a ball of energy and keep all of us running and on our toes. She did very little fussing. Our last day in the Bob. We had Eggs and Bacon for Breakfast. We spent the morning packing up camp. It always seamed to take a long time to get everything loaded up. We set up Todd’s electric bear fence around the tent for Cameron. He would be there alone with a dead mule in camp. He wanted a little extra protection while he sleep. We heard after we got home that two Grizzly Bears did come in and were fighting over the mule. We were down one mule and need another to pack out the meat, so we used two of Cameron’s. We packed ham and cheese sandwiches to eat while riding. It was another long ride out. At one point during the ride, we met another hunter and mule train in a tight area of the trail. Todd lead us in to the woods and we let the other party pass. Todd knew the man, he was the county sheriff. We also met three people hiking. It was late when we got onto the trail and we spent a good bit of time riding in the dark. Sarah was leading and was the only one with a light. Too many light would confuse the stock so it is best to only have the one. We were still several miles from the end of the trail and riding in the dark when we came to a stop. I was in the back of a 60 yard mule train. We could not tell what was the problem but after a few minutes we started moving again. We found out the next day that Sarah had heard a strap snap on one of the mules. She heard it and knew what it was. Then stopped us and had Todd fix it. Her skills with the stock was amazing the whole trip. The moon was almost full and we could see the outlines of the mountains. We got back to the trail head at 11 PM. The sheriff told us about a pizza that he had in his truck. That was a nice bit of Trail Magic when we got there. Another hour to unload the packs, take off the saddles and pack the trailers. We got back to the wilderness lodge after midnight. We turned the horses and mules into the coral and spent the night in the cabins again. We loaded the stock up for the last time, said good by to the Wilderness Lodge and drove the long the 52 mile dirt road out of the Flathead National Forest. Once in Colombia Falls we stopped and ate breakfast at the Night Owl. We then stopped at a bar called the Blue Moon to see the owners big game trophy collection of Polar Bears, Grizzly Bear, Big Horn Sheep, Elk, Deer and so on. Back at Todd’s house, we unloaded the stock and supplies. Processed the meet of Brett’s Elk. Showered and repacked our bags that we would ship home. We then wanted to take Sarah out to dinner, to thank her for all she did while on the trip. We went to the nicest place around, On The Rocks. We pulled up and there were like 10 cars in the parking lot and Todd and Sarah said it was packed. We had to wait 10 minutes for a table. Apparently that was unusual. I think we all had stakes. Mine was delicious. One more breakfast at Jacks in the little town of Eureka, Montana. Todd then showed us his old house on the way to the airport. We all said our good byes. Brett was on the same flight to Saint Paul, Minnesota as we were. We ate dinner together at the airport, then he went on to D.C. and we made it to Atlanta by midnight, where Tony and Sonya were waiting to pick us up. Some closing stats from the trip. Google Earth photo of the Chinese Wall Continental Divide where we made our Spike camp. The Lake in the foreground is Levale. Lake in the background is Heat Lake. Spotted Bear River is top right. Our Spike camp was almost center of the photo. Point on the left of the lake is where I walked to, 8300 feet above sea level. Just as high as Table Mountain in the top right. Google Earth photo of Pivot Mountain where Brett killed his Elk. The location was down the ridge to the right of the Pivot Mountain Summit in one of the clearings about low center of the photo. Our Camp was about dead center along the river, but we had to ride up the ridge line of the mountain to get to the hunting spot. Table Mountain it top left. Spotted Bear River runs down the photo. This was a great Western Adventure. I was invited to join my brothers on the same trip they had taken a few years ago to the Bob Marshall Wilderness in Montana. The Bob is a one Million acre Wilderness in the middle of 4 million acres of national forest. It’s northern border is the southern border of the Glacier National Park. It is a 14 day trip with 10 days in the Wilderness. For those who may not know, a wilderness doesn’t have roads and mechanized equipment is not allowed. Bicycles are not allowed much less gas-powered equipment. The group will be Todd, Keith, Brett, and myself who will join Todd Hunter along with his wife and three-year old daughter. On day one we will fly out to Salt Lake with a layover in LA before flying on into Montana. Todd will pick us up at the airport. We will spend the next day gathering last-minute items and packing. 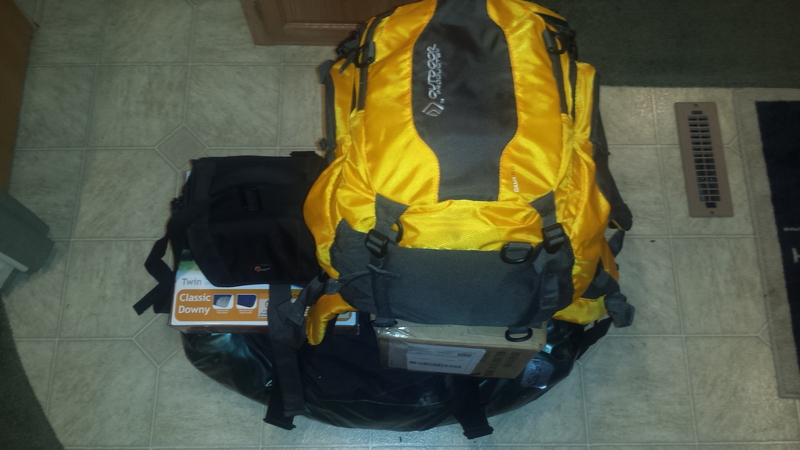 We will ship most of our supplies days early and have a mule team pack our gear in for us before we get there. 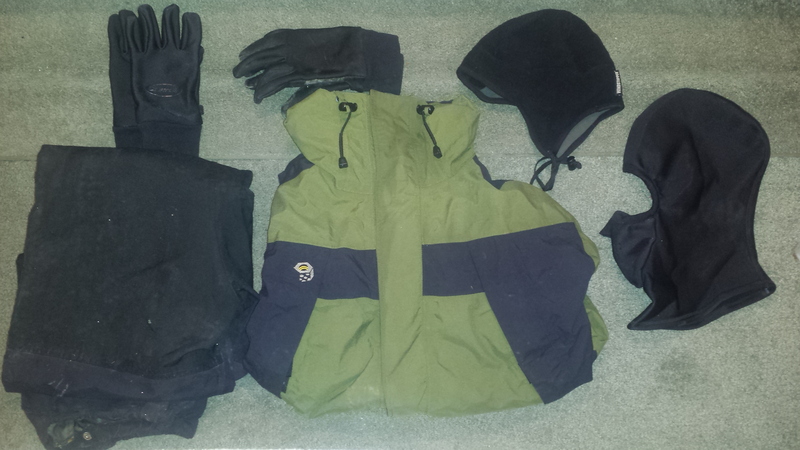 What we will be carrying will be our clothes and small items. On day three we will get up early and load up the horses and drive several hours to the national forest that surrounds the Bob. Then a few more hours on the dirt roads to the trail head where we will unload the horses and pack them up. It is a 20 mile ride to the campsite on the Flathead river. Day four will be cutting firewood and finish setting up camp. Day five will be the opening of Elk season. Todd and Brett will be hunting. I plan on doing a lot of fishing and hiking. We will pack out on day twelve and fly home on day fourteen. 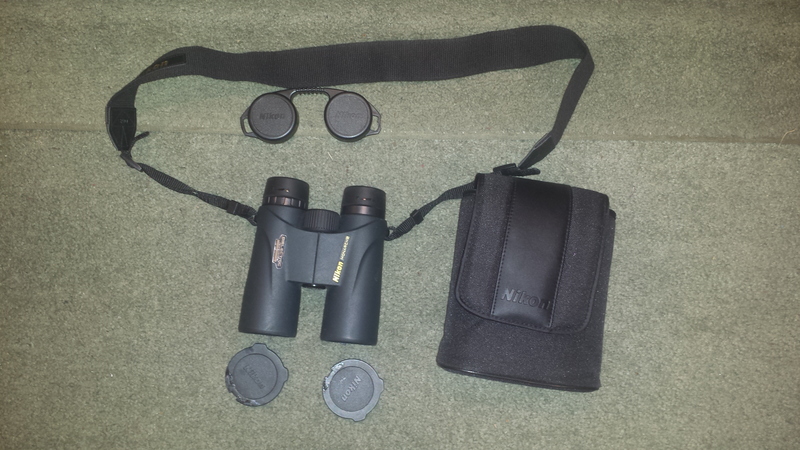 I have started to gather the items that I will need on the trip. I have to get it ready to ship out. 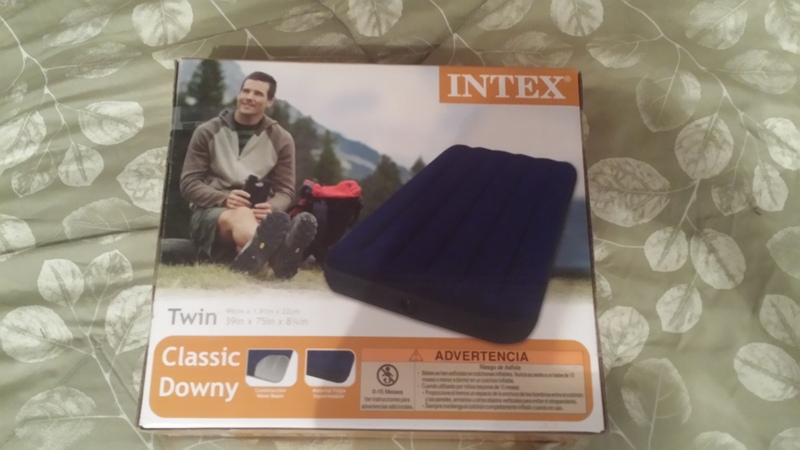 I bought an air mat, ordered a hiking guide-book, ordered a case of MREs, and ordered hip waders. I am in the process of going through my supplies and packing. But first I was thinking of a survival kit. We will be in very remote county and you never know what will happen. 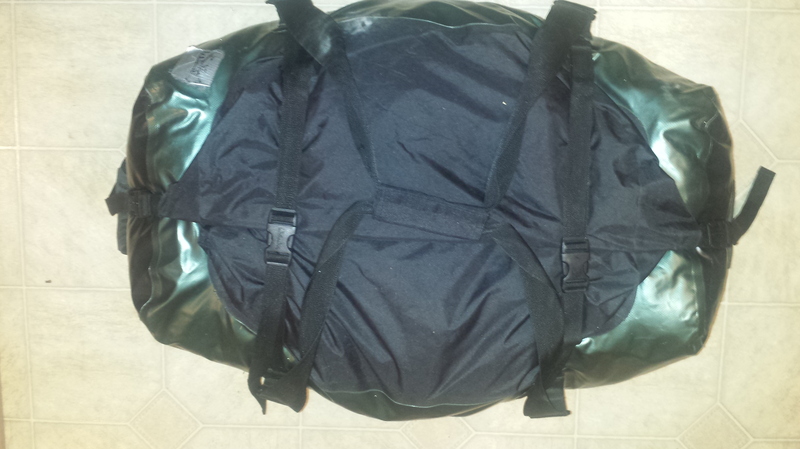 While the camp will be well stocked with anything we need, I want a pack that I can carry with me anytime I leave camp. Here is what I came up with. 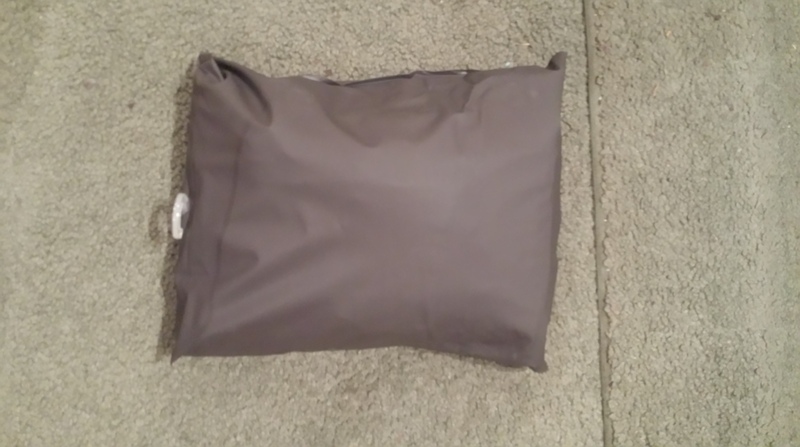 A 7 by 9 tarp for a shelter. Water filter life straw with bag. First aid kit stocked with 6 band aids, 2 butterfly bandages, 4 small band aids, 2 round small band aids, 2 gauze Triple Antibiotic, Sting relief, antiseptic wipe, razor, med tape, candle, and water proof matches all in a ten box. 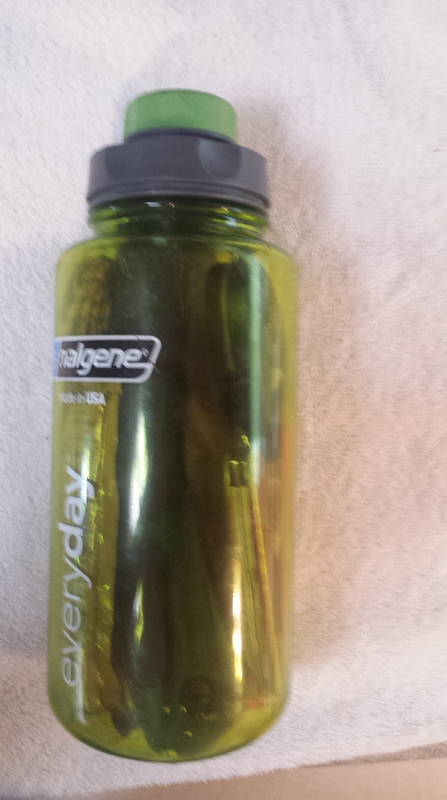 In a 32 oz water bottle that has measurements marked on the sides I put a saw, several fishing hooks, 20 feet of fishing line, artificial bate, lighter, Swiss Army knife, whistle, compass, 2 packs of peanut butter, hand warmer, light stick and cord. I lashed the bottle to the bag with the tarp and first aid kit. 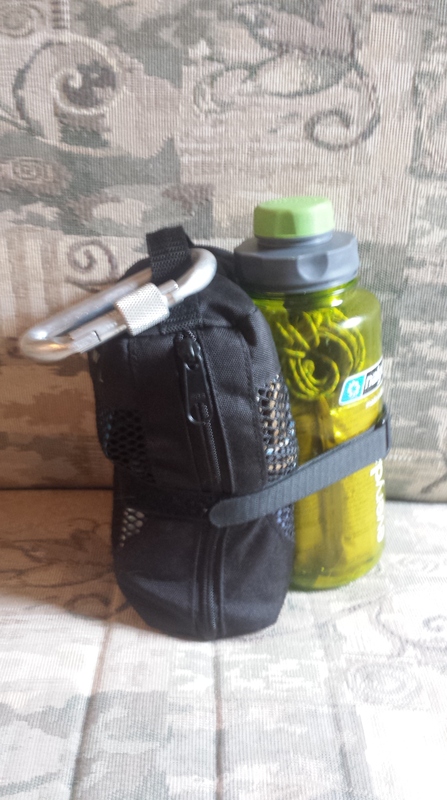 Then added a carabiner. All together it is less than 5 pounds. This will help me survive a few days if need be. The following is a list of the items I will be taking from home to the Bob. We will pick up a few items once in Montana like more food and bear spray. This is my ENO hammock system. 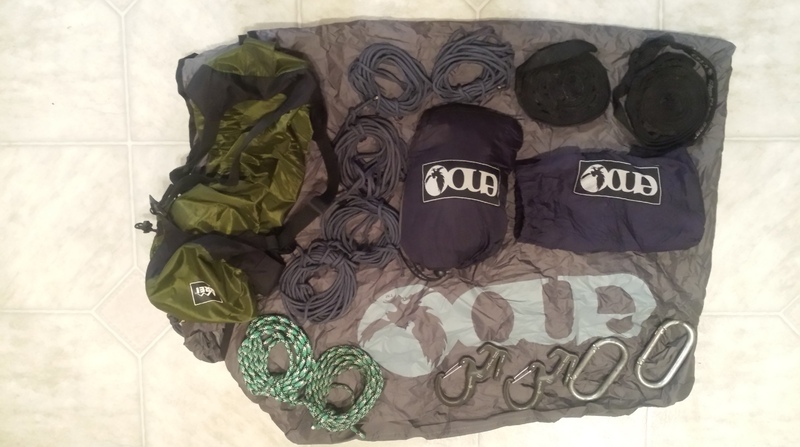 It includes the 2 man hammock, 2 Slap Straps, Rain Fly, 7 sections of 5 foot each paracord, 2 carabineers, 2 quick tie carabineers and bag that it all goes into. 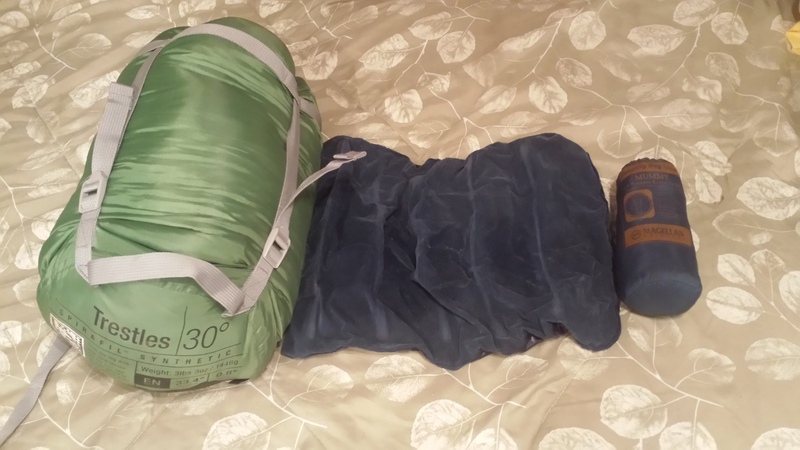 This is my 30 degree sleeping bag, air pillow and silk sleeping bag insert. The silk increase the warmth of the bag. 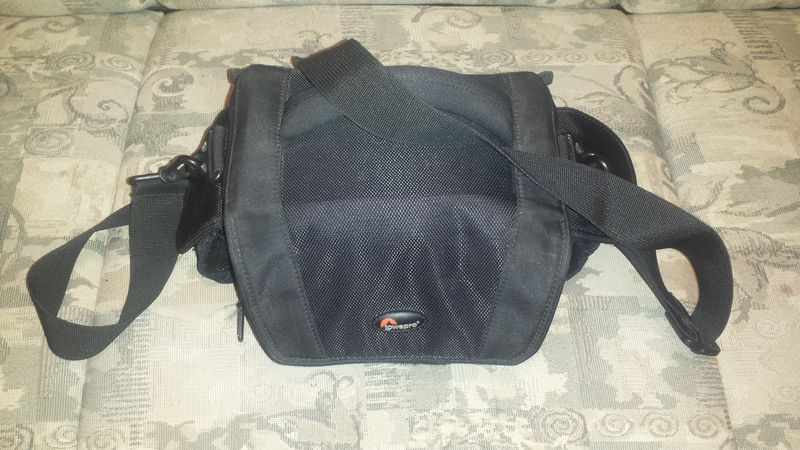 Odds and Ends Bag. 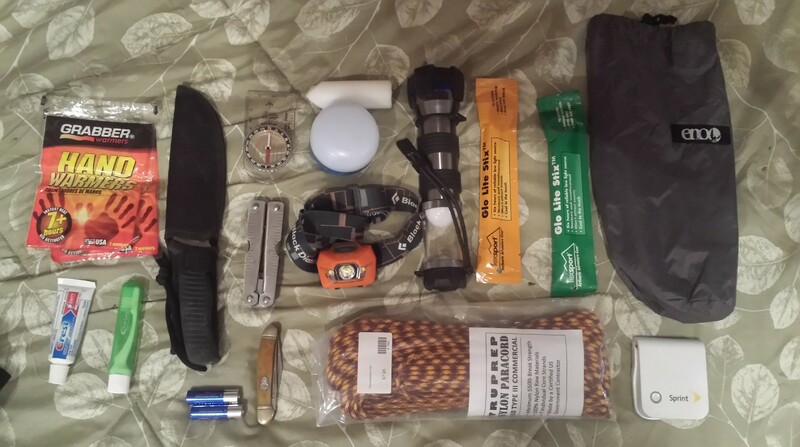 2 pair of Hand warmers, Tooth Past and Toothbrush, large knife, Compass, Leather Man multi tool, pocket knife, AA batteries, Candle, Lamp, Head Lamp, Flashlight with lamp, 2 glow sticks, 100 feet of paracord, battery charger for phone and bag. 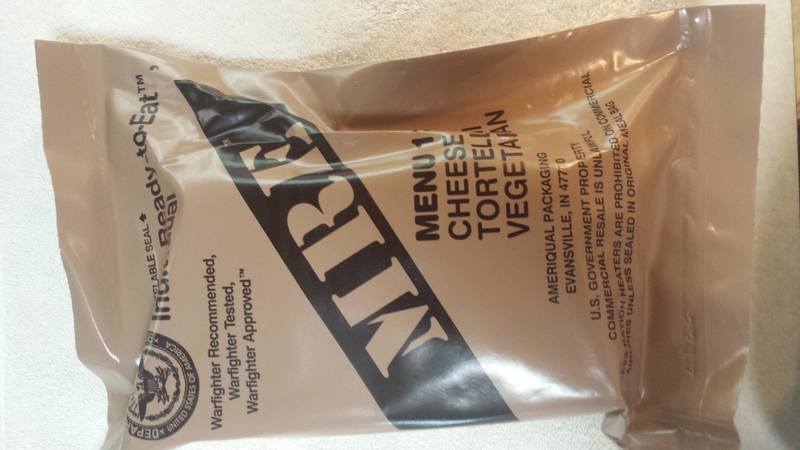 This is to show what is inside a MRE (meals ready to eat). Gum, Salt, Seasoning, Most Towel, Toilet Paper, Drink mix, Energy bar, Applesauce, Crackers, Main Meal, M&M, Spoon, Peanut Butter. You put the Main Meal in the green bag, add a little water, fold over the end and place it in the box. A chemical reaction takes place and heats the Meal. 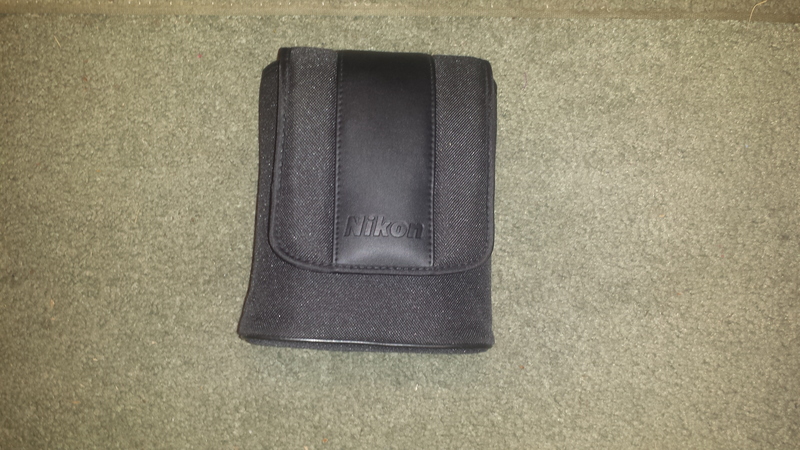 This is the camera equipment I will be taking along with my phone. 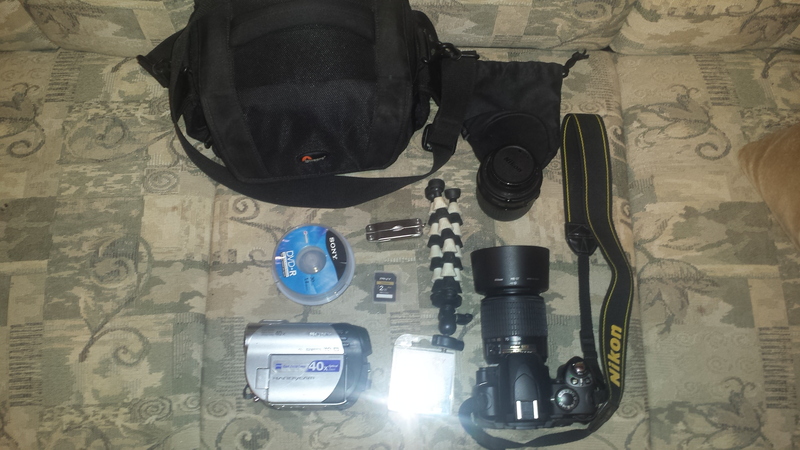 Camera Bag, mini CD for the camcorder, Camcorder, utility knife, extra memory card, tripod, bag for extra lens, 35 mm to 55 mm, camera with 55 mm to 110 mm zoom with and a polarizing filter. 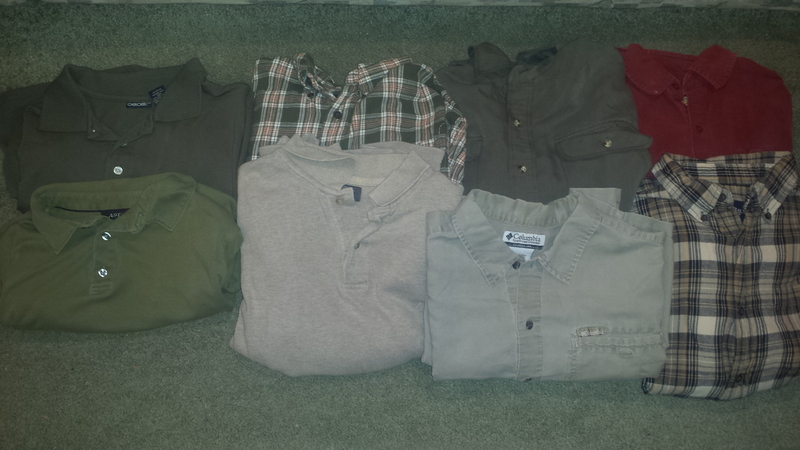 Three Blue Jeans, Two Camouflage Paints, One Weather Proof Paints, Six Long sleeve shirts and two short sleeve shirts. Survival Kit. 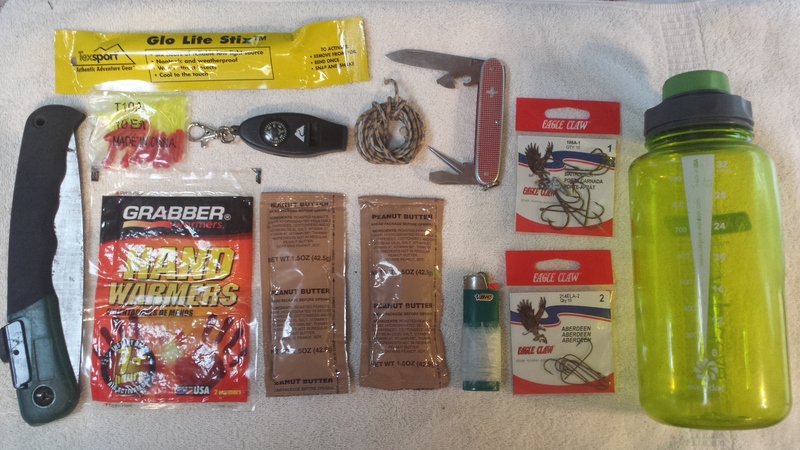 Saw, Glow Stick, Artificial bate, Hand Warmers, Whistle and compass, cord, two Peanut Butter, Swiss Army Knife, Lighter with 20 feet of fishing line, two different size fishing hooks and a water bottle with measurements listed on the side. 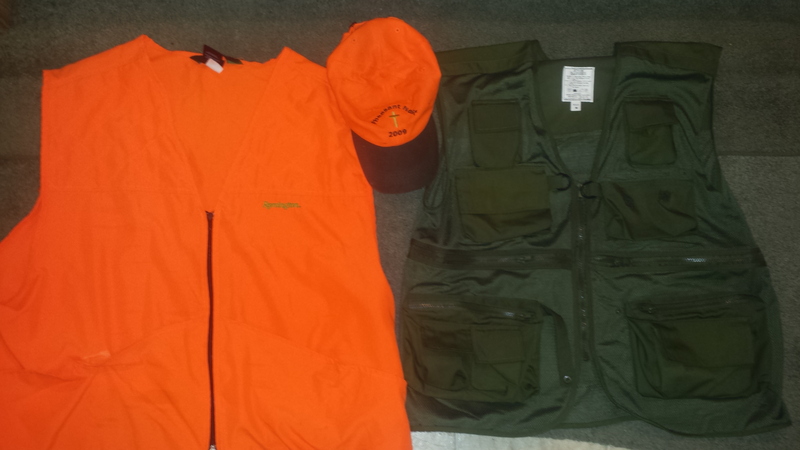 Orange Vest and hat for Hunting. Fishing Vest. Two pair of gloves, Rain Paints. 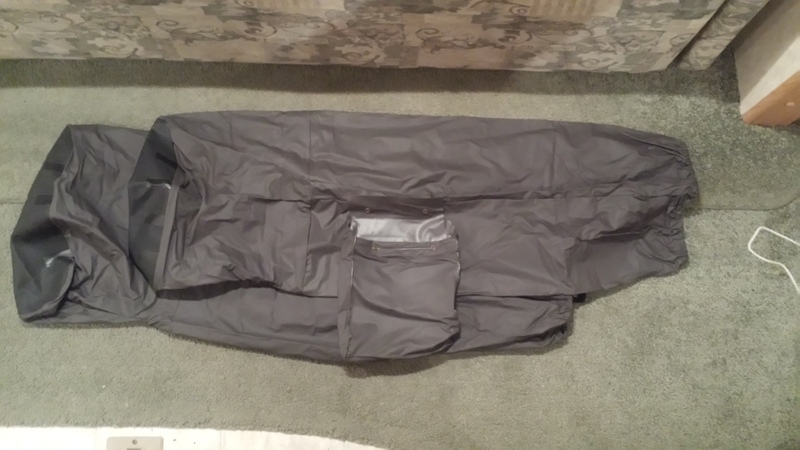 Rain Jacket, two different toboggans. 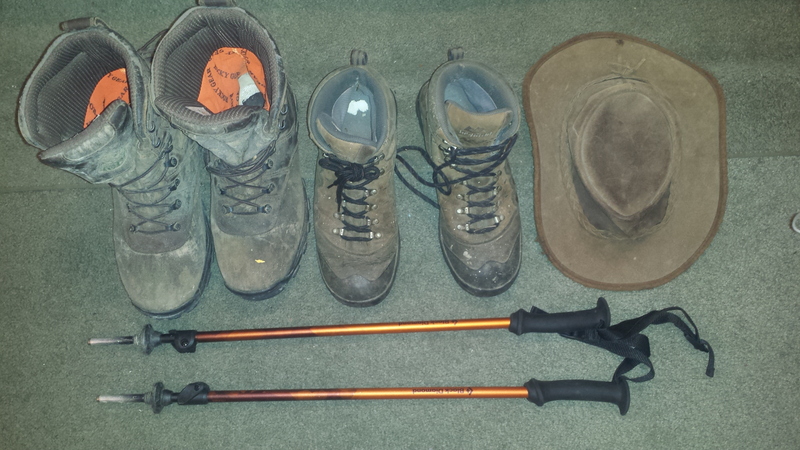 High top water proof boots, Hiking Boots, Cowboy hat, tracking poles. 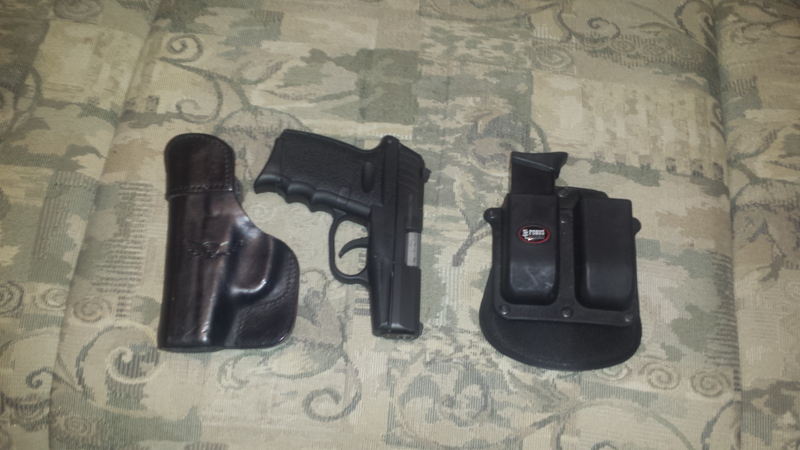 9mm pistol with holsters and extra clips. 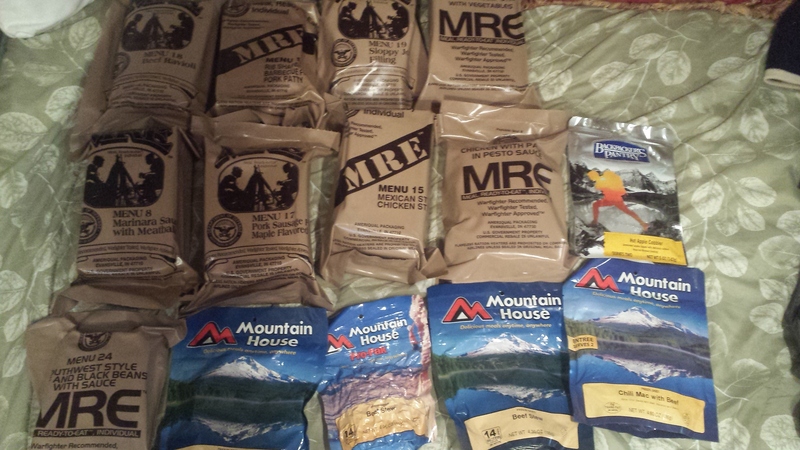 Nine MREs and 4 Mountain House dinners with one desert. 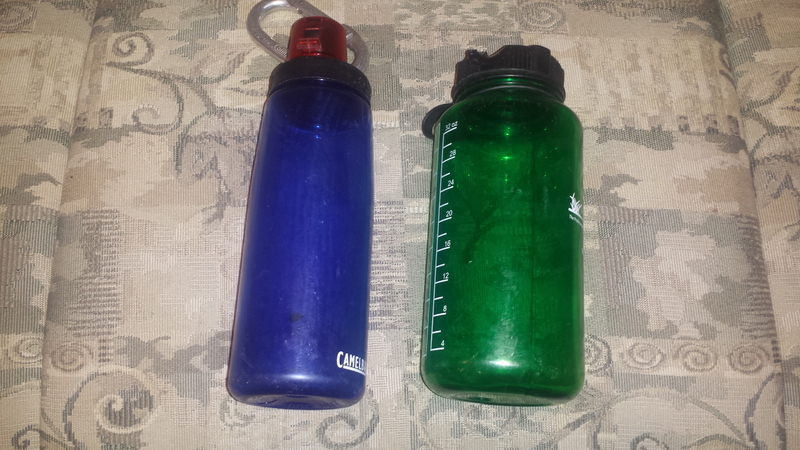 Two water bottles. 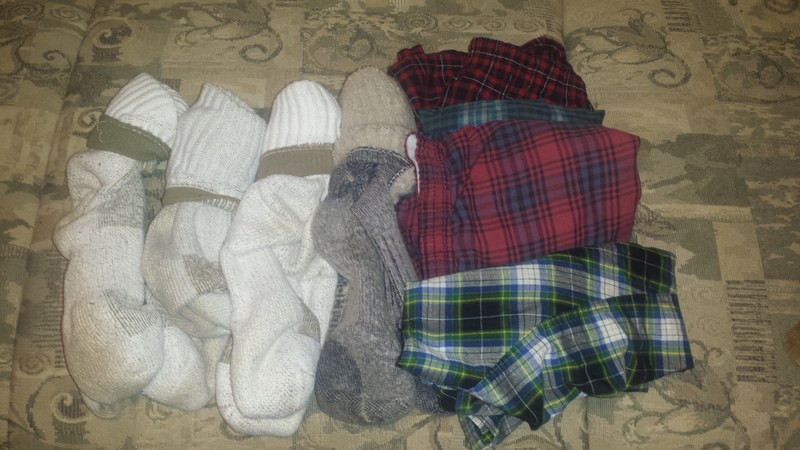 Four pair of socks (I added 4 more pair), 4 pair of underwear. 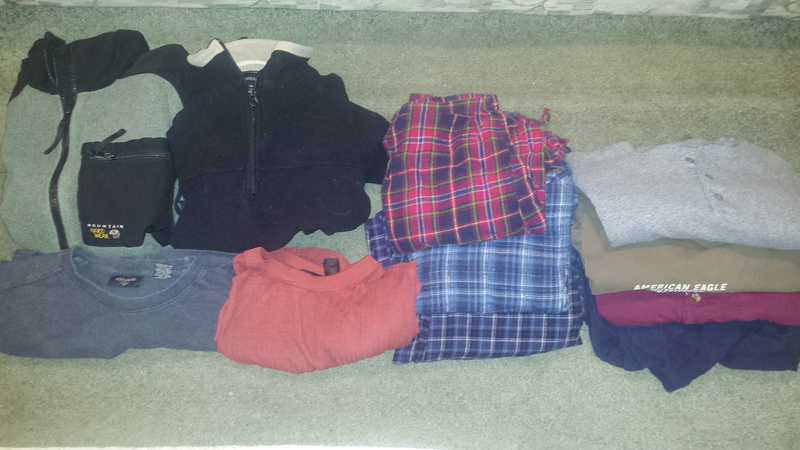 Fleece Vest, Fleece pullover, two tee shirts, three under paints, 4 long sleeve under shirts. 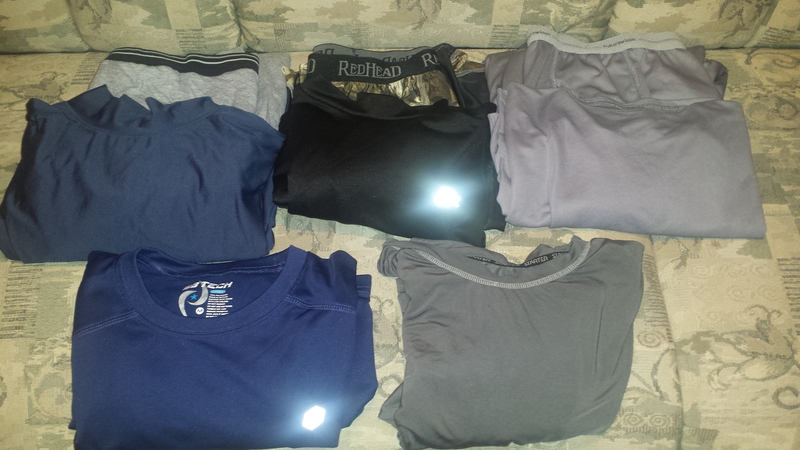 Three sets of insulated underwear and one long sleeve under armor and one short sleeve under armor. Air Mat. 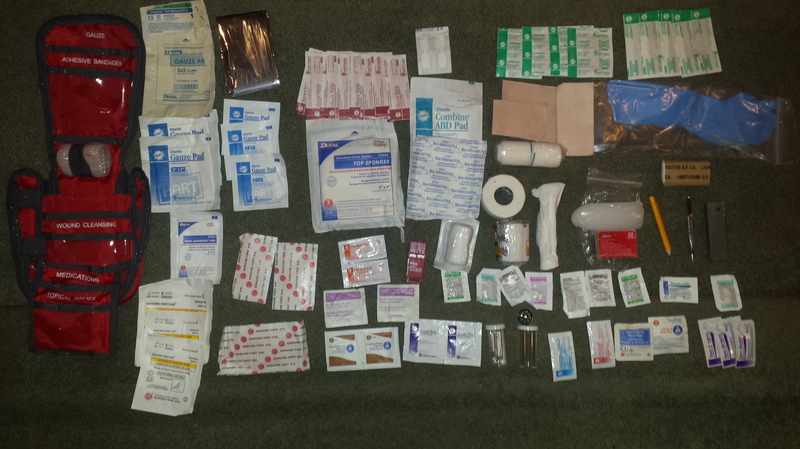 I updated my first aid kit to this one that had a lot more items. 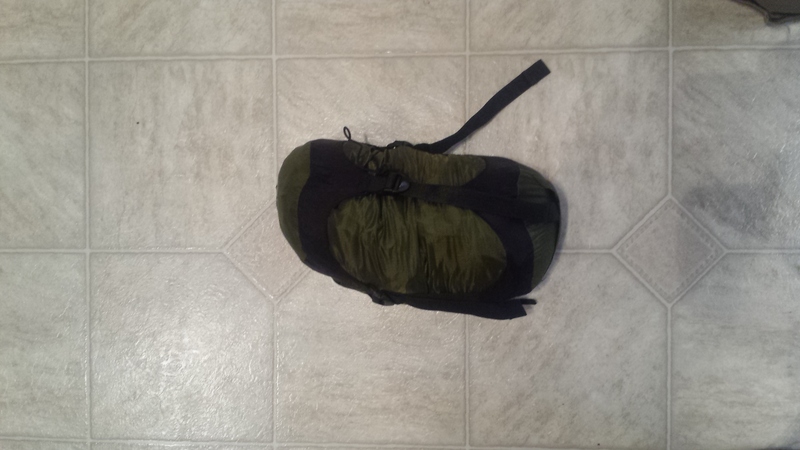 Everything but my food, Camera and a few items in my day pack. This is all I am taking with me. 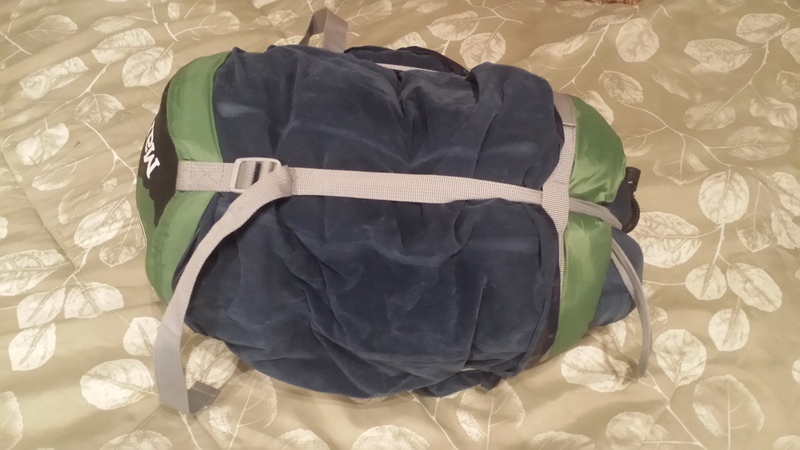 I was able to get the air mat into the duffle bag. Update. August 23rd. T -18 days. Several wildfires are burning in the western states, including Montana. It has been very dry there and it has been a bad year for fires. They have claimed the lives of firefighters, burned homes and thousands of acers of land. Todd got word from Todd Hunter that a 400 acer fire grew to be a 10000 acre fire over night on Friday. It burned the parking lot of the Meadow Creek trail head where we were to start our ride into the Bob on houses. Trucks and trailers belonging to people who were in the Bob at the time were destroyed by the fire. Todd Hunter was helping with the evacuation. From the National Forest Web Site on August 24th. FIRE SUMMARY: Two large fires are being managed by the Northwest Montana Type 3 Incident Management Team Bear Creek Fire and Trail Creek Fire. Management objectives and priorities for the fires are: Firefighter and public safety, minimizing the impacts to recreationists, local outfitter & guides and resorts, and protection of the Spotted Bear Ranger Station facilities. Bear Creek Fire – Size: 19,595 acres. The fire burned today with moderate fire behavior and moved toward the east onto Meadow Mountain and is moving down Larch Creek to the north. Firefighters mopped up hot spots at Meadow Creek Trailhead and completed structure protection (wrapping with fire resistant material) on the recreation facilities loading ramp, hitch rails, bulletin boards and the Meadow Creek Gorge Pack Bridge. Trail Creek Fire – Size: 9,500 acres. The Flat Creek Fire and Trail Creek Fire have joined and will now be managed as the Trail Creek fire. A management objective for this fire is to keep the fire to the north of the Spotted Bear River Road. – The Spotted Bear River Road #568 is closed, as well as the trailheads and trail systems which start from this road. – An extensive area closure for the Trail Creek Fire is in place in the upper Middle Fork from the Spotted Bear River Road and the Eastside Reservoir Road around Upper and Lower Twin Creek, eastward to Dolly Varden Creek. -A large area closure is in place in the northern portion of the Bob Marshall Wilderness. The Meadow Creek and Gorge Creek Trailheads are closed. The Eastside South Fork Trail #80 is closed from Meadow Creek Trailhead south to Damnation Creek. Access to the Bob Marshall Wilderness is via western and southern trailheads. See the map above. We were to camp on Black Bear Creek just above Black Bear Cabin. We were to enter on the yellow road that is now closed and come down the yellow trail that is now closed. Maybe the area will be reopened by the time we get there. Todd is looking for other locations for us. We may have to come in another way and camp closer to the Salmon Forks Cabin as I understand it. Two fires in the remote Spotted Bear Ranger District of the Flathead National Forest on the edge of Montana’s Bob Marshall Wilderness exploded late Thursday, prompting emergency evacuations of outfitters and more than 70 head of stock and the closure of a major wilderness trailhead. The Bear Creek fire, about 55 miles south of Hungry Horse, exploded from 465 acres Thursday morning to 17,755 by evening, driven by high winds. The Trail Creek fire grew from 3,500 to 8,463 acres, consuming a smaller fire as it moved through the heavy timber. Al Koss, a public information officer, said even computer modeling couldn’t predict how fast the fires would move. “It was just a very unusual situation that occurred yesterday,” Koss said. With the fire headed toward the Meadow Creek Outfitters, which has five corrals used by outfitting businesses, Forest Service personnel teamed with outfitter employees to round up 70 mules and horses. Halters had to be put on the animals, which then had to be loaded onto trucks. The evacuation, which was occurring at about 6 p.m., proceeded efficiently, Koss said. The remote U.S. Forest Service ranger district is on the southern end of the Hungry Horse Reservoir. Employees arrive in May and move out in December. It includes homes for employees, bunkhouses and a warehouse. There wasn’t room to fit all of the animals in the trailers, so some were let loose. A person on a horse moved them down the road and out of the fire’s path, Koss said. No injuries to people or stock animals were reported, and no structures were lost, he said. As the operation was finishing up, the fire was moving down the hill toward the trailhead, Koss said. Once they were out of danger, forest personnel and the outfitters watched the fire roar through. After it passed, they went back in and started putting water on the Meadow Creek Gorge Pack Bridge so it wouldn’t burn. However, a few outfitter vehicles and trailers were burned, as well as some hay. The two major fires are just two of more than 20 burning in the Spotted Bear Ranger District in the Bob Marshall Wilderness and the Great Bear Wilderness. The fires were sparked by lightning storms that passed through on Aug. 12 and Aug. 14. A type III incident management team has been assigned to two major fires. Given how fast the fires moved, structure protection is now occurring at the Spotted Bear Ranger District compound, which is 10 miles north of the Bear Creek fire. The high winds pushed the Bear Creek fire east down Bunker Creek and across the South Fork of the Flathead River. The fire moved through the Gorge Creek and Meadow Creek trailheads and the Meadow Creek Outfitters Corrals. Heavy winds drove the blaze through heavy fuels and it built up energy as it moved across the landscape, faster than computer modeling had predicted it could move, Koss said. Thinning of fuels that occurred in the area over the past few years helped to reduce the severity of the burning through the trailheads, he said. The Meadow Creek trailhead, a major trailhead into the Bob Marshall Wilderness, has been closed. With the trailhead closed, the wilderness will now need to be accessed from the west or southern sides. The Bear Creek Fire near Spotted Bear swept through about eight miles of forest, jumped the South Fork River and grew from 465 to 17,755 acres in just a few hours Thursday afternoon. The fire’s rampage torched vehicles, sheds and trailers at the Meadow Creek Trailhead, although livestock were rescued from the fire area. The fire was sparked by lightning Aug. 12 and by Thursday morning had only burned about 465 acres in the Flathead National Forest several miles south of the Spotted Bear Ranger Station. Then it erupted on Thursday, driven by rising temperatures and wind. No one has been injured in the fire’s expansion, and the only threatened structure, the Meadow Creek pack bridge, has been outfitted with sprinklers and was untouched — despite the fire burning on both sides of the creek. “What protected the bridge, it’s open around there, and as soon as crews were able to get into that area they started wetting it down with water from the engines,” fire spokesman Al Koss said. The Trail Creek Fire, another lightning-caused fire south of the ranger station, also was stirred up by the windy conditions Thursday, more than doubling to 8,463 acres from 3,500 acres. Koss said firefighters were able to get about 70 livestock out of the Bear Creek Fire area unscathed, and wilderness rangers swept through trails to guide eight to 10 visitors to safety. The fire has since slowed down but had still seen some activity Friday afternoon as it continued to move east. Winds were gusting at about 30 to 35 miles in the area on Thursday. Koss said no suppression activities are being conducted aside from point protection, assessing where the fire is headed and what structures may be threatened. About 10 miles north of the fire front sits the Spotted Bear Lookout, and the Black Bear Cabin is about 10 miles south. No structures are currently threatened, but forest officials are planning to wrap both structures in fire-resistant materials in the next couple days. While the fire tore raced through the densely wooded area, Koss said that fuel reduction around the Meadow Creek outfitter corrals and Gorge Creek helped keep property damage to a minimum. Update Aug. 26. The Bear Creek Fire east of Swan Lake continues to be the largest blaze in the state, chewing through more than 28,000 acres. On Wednesday, fire crews were mopping up the area around the Meadow Creek Trailhead that burned late last week when the fire grew from 465 acres to more than 17,000 in just four hours. Fire crews are also working on protecting various backcountry structures in the area. Fire Tower being covered with fire resistant material. Posted: Wednesday, August 26, 2015 8:06 am | Updated: 5:21 pm, Wed Aug 26, 2015. Frustration, awe and relief. That might best describe the mood at the Spotted Bear Ranger Station as fires burned both to the north and south of the remote outpost on the north end of the Bob Marshall Wilderness. The Bear Creek Fire struck awe Thursday afternoon, defying the best fire models as it burned more than 17,000 acres in just a few hours. The fire had skunked on the slopes above the Bunker Creek Road for several days but appeared to be in check. But on Thursday afternoon it burned down the slope, crossed the Bunker Creek Road and got a head on the north slopes, explained incident commander Andy Huntsberger. The north slopes in a normal year are wet, but in this historic dry year the fire took off and raced down the Bunker Creek Road and across the South Fork of the Flathead in a matter of hours. Both private citizens along with Forest Service and fire crews were able to get about 70 head of stock out of the outfitter camps before the fire blew over. No animals or people were injured but three vehicles burned – two older trucks and a newer Subaru as well as some stock trailers, a tack shed, an outfitter tent and some hay, said public information officer Al Koss. The fire is now more than 28,000 acres. But despite the fire’s intensity, it laid down when it got to the Meadow Creek Trailhead and campground, where the forest had been recently thinned. Other thinned areas along the Meadow Creek Road had spot fires, but were not actively burning. By contrast, the unthinned areas were a moonscape of fried trees. The Meadow Creek pack bridge was unscathed by the blaze, though a bridge in the upper end of Bunker Creek did burn. Huntsberger said the fire defied the models. He said their fire analyst has run the scenario through computer models several times and it still doesn’t do what Mother Nature cooked up. There was also sense of frustration among Forest Service personnel from the Trail Creek Fire. The fire, burning 9,500 acres north of the Spotted Bear River Road, had burned through timber sales – sales that would have likely been harvested by now had they not been held up by several years of litigation – litigation that the Forest Service prevailed on. The sales were designed to thin the forest and restore historic Ponderosa pine stands in the area that had been overcrowded by fire prone species like lodgepole pine. The Bear Creek Fire is now listed at more than 28,700 acres and is moving to the east in the Bob Marshall Wilderness. It’s about four miles from the Spotted Bear Ranger Station. Protecting the ranger station and nearby outfitter camps is the top priority for fire managers. A host of trails, including the Spotted Bear River Road, Spotted Bear Campground and the Meadow Creek Road and campgrounds area are all closed. Al Koss looks over the Meadow Creek Trailhead and camp where a previous thinning project stopped the Bear Fire from destroying the campground. Posted: Thursday, August 27, 2015 5:24 pm | Updated: 1:30 pm, Fri Aug 28, 2015. As fires bloom, the options to recreate in the Bob Marshall Wilderness are rapidly diminishing. The Spotted Bear Ranger District will shut down the entire wilderness portion of the district because of fires and fire danger beginning Friday morning, fire information officer Al Koss said. That includes lands in both the Bob Marshall and the Great Bear wilderness areas. The closure includes the Schafer Meadows Airstrip. The nonwilderness portion remains open although Spotted Bear Campground is closed. Koss said wilderness rangers are giving people already in the backcountry a few days to get out of the area. The decision came as at least 20 multiple fires burn in the district east of the Flathead Valley. One new fire, detected Wednesday is near Lena Lake in the wilderness. That fire is now 40 acres, forcing the closure of the Holland Lake Trailhead. The Meadow Creek Trailhead also is closed due to fires. On the other side of the mountains, meanwhile, the Rocky Mountain Ranger District has closed the Benchmark Trailhead as well as several trails up and down the Rocky Mountain Front due to fires. The Benchmark Fire is about 50 acres, according to public information officer Wendy Clark. The Benchmark closure means three of the most-used trailheads into the Bob Marshall Wilderness are now closed. The Benchmark Road is closed from the Benchmark Wilderness Ranch to the trailhead. An evacuation order is in place for dwellings in the area. In Spotted Bear, outfitter ranches in the area have been fitted with sprinkler systems and a line was put around the Wilderness Ranch on the Meadow Creek Road, Koss said. The lodges in the area are privately owned but are on land leased from the Forest Service. The Bear Creek Fire, the largest in the state at more than 28,000 acres, is working its way down to the Meadow Creek Road near Jungle Creek. Crews have created a shaded fuel break in the area to keep the fire from spreading east toward the Spotted Bear Ranger Station as well as the Spotted Bear Ranch and Diamond R Ranch. The fires could gnarl hunting season in the backcountry. Archery season starts Sept. 5 and general hunting season starts in the wilderness Sept. 15. 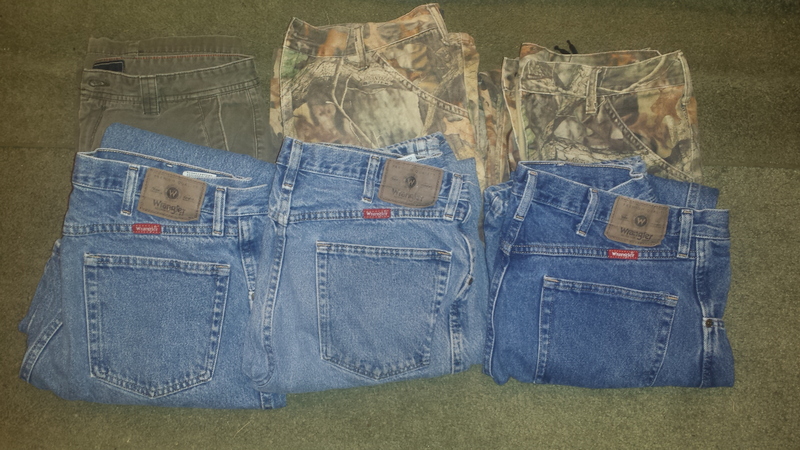 Many outfitters rely on the hunting season for their livelihoods. This map shows closed areas on the Spotted Bear Ranger District due to 20 fires burning on the district. I think this latest closure got our back up plan. Just to give an idea of what is going on in the wilderness. Mother Nature threw up a long detour for a group of friends turned away last week by the Bear Creek Fire in the Bob Marshall Wilderness. “We could see the trees torching,” said Luke Kantola of California. Kantola and his friends Charles McGrail, Clara Hanson, Vinnie Inzano and Colin Arisman had hiked in the Bob Marshall Wilderness down the South Fork of the Flathead to the White River junction. Once there, they floated in pack rafts to just a couple of miles above the Mid Creek takeout. They made camp and could see the smoke and a glow in the distance but didn’t know how far away the fire really was. A wilderness ranger came into camp told them they had to turn around. They hiked back to Black Bear Cabin, arriving at 2 a.m. They spent the next day at Black Bear and rested up a bit. Smoke and ash from the fire rained down on camp, but the Forest Service crew there made sure they fed well. The next day they hiked out via Smith Pass, 32 miles in one day. Once there, they were met with the kindness of strangers again. It was about 10:30 p.m. when they got out, but a crew from Swan Mountain Outfitters got them food and gave them a ride back to Spotted Bear. The group gave a big thanks to the Forest Service, including wilderness ranger Rich Owens, and Swan Mountain Outfitters for all their help. On Sunday, they were reunited with their vehicles and were making phone calls back home from Spotted Bear, to tell family members they were OK.
Save for a few blisters and a good coating of dirt and soot on their clothes, they were no worse for the wear. The group has plans to return next year so they can complete the trip. 3 miles SW of the Spotted Bear Ranger District, 57 miles from Hungry Horse. Assess Bear Creek Fire outside of wilderness for opportunities for direct suppression to reinforce point protection priorities. Implement suppression tactics with limited resources to protect improvements and infrastructure. 24 hours: Humidities are expected to increase although winds will become breezy during the day. Precipitation possible. 48 hours: Winds will become breezy during the day. Seasonal temperatures. Rh dropping. IMT3 is also managing the Trail Creek Fire (21,100 acres). The Lake Creek Fire was consumed in the Bear Creek Fire. With a cool and rainy weather pattern in place, the focus on the Bear Creek Fire turned from fire management and suppression to safety considerations, trail rehabilitation and preparing wilderness access for the upcoming hunting season. The fire burned through a small area impacted by a previous wildfire on its southern flank, but made little other movement. While smoke could be seen from Black Bear Cabin, the structure was not threatened by the fire’s expansion. Current and forecasted weather will provide firefighters with a window to finalize containment efforts on spot fires and work on removal of hazard trees and slash associated with the shaded fuel break on the Bruce Creek and Meadow Creek Roads. Selected heavy equipment used during suppression activities is being demobilized, while sawyers are being brought in to handle technical hazard tree falling needs. A trail assessment crew from Spotted Bear Ranger District will be mobilized to assess trail clearing needs, with a focus on reopening access points and trails as soon as it is safe to do so. Structure protection (hoses, water pumps, and sprinklers) remains in place at the three guest ranches – Diamond R, Spotted Bear Ranch and Wilderness Lodge as well as the Spotted Bear Ranger Station itself. Most structure protection personnel have been re-allocated towards helping with hazardous tree removal operations on the Bear Creek and Trail Creek Fire areas and surrounding access roads. Cool and rainy weather continues at the Spotted Bear Ranger District in the vicinity of the Bear Creek Fire. With fire activity significantly reduced and debris associated with construction of shaded fuel break removed, selected crews and machinery assigned to the fire are being demobilized. Sawyers are focusing efforts on felling hazard trees along roads. A trail assessment crew from Spotted Bear Ranger District will assess trail clearing needs today, with the dual objectives of evaluating work needed to provide access to backcountry administrative sites and assessing work needed to reopen access points and trails. Preparing the wilderness for the upcoming hunting season remains a priority. Structure protection (hoses, water pumps, and sprinklers) remains in place at the three guest ranches – Diamond R, Spotted Bear Ranch and Wilderness Lodge as well as the Spotted Bear Ranger Station itself. Protective wrapping (i.e., fire-resistant wrap) will be removed from selected structures, such as bridges surrounded by burned forest. Most structure protection personnel have been re-allocated towards helping with hazardous tree removal operations on the Bear Creek and Trail Creek Fire areas and surrounding access roads. Last updated on the Bear Creek Fire. The area has received rain and the fires are contained or out. Higher elevations have received snow. In Preparation for the trip, Keith gave me two books to read. The one I read first was “When the Woods Were Wild ” by Stephen Hawkins. Stephen is who Told Hunter bought his outfitter business from. Todd no longer has the business. The book gives a back story of Stephen’s childhood and how his love of hunting grew into a very good business. The book gives a insight into the world of an outfitter. There is a lot of work that goes into each trip. Transporting supplies into and out of the wilderness is a large task. A normal hunting or fishing party would be 6 to 8 people. Then it would take another 4 or 5 guides, wrangler and cooks to support the group. There maybe 12 people or more that needs food, shelter and clothing transported in on horseback and mule. A large group may need 15 to 20 pack animals plus the horses for the people to ride. That is a lot to keep up with. One thing I learned is that a line of mules tied together is called a pack string. The other thing I learned is that mules and pack strings have wrecks. This is why a small rope is used to tie each mule to the next. If a heavy rope is used and a mule wrecks, I will take the whole pack string with it. But with a small string it will break and only one mule would be lost. 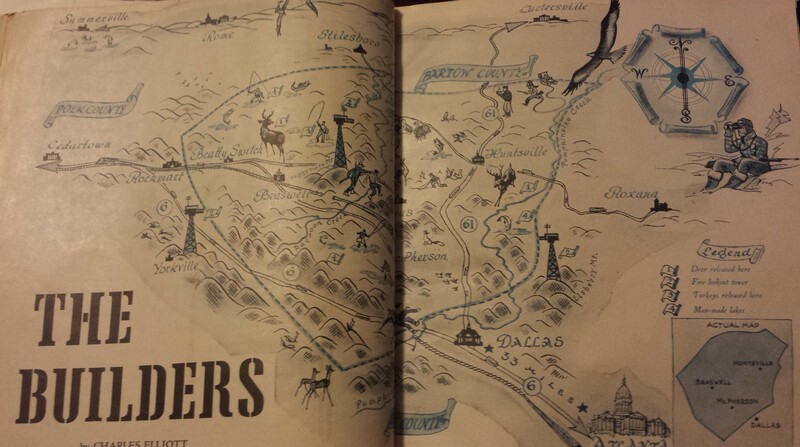 The other book I read was by Howard Copenhaver called “They Left Their Tracks”. 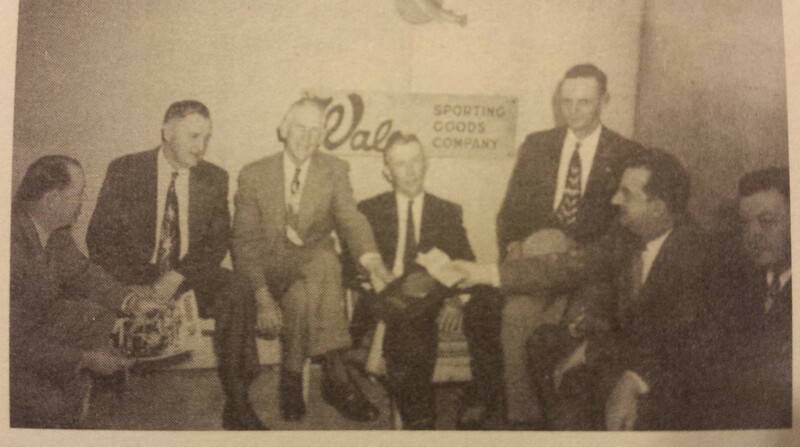 He and his brother started guiding before World War II and continued after the war, some 60 years as an outfitter. He tells short stories of trips and interesting adventures with guest and crew. He is a bridge from the old west to the present. In fact one of his hands rode with Butch Cassidy. Reading these books about the Bob and Outfitters has given me a little insight into the Bob Marshall Wilderness and what to expect. The Bob Marshall Wilderness has the largest concentration of Grizzly Bear in the lower 48 states. The Bob is home to more than a thousand. Though a concern, I am not to worried about them. I have camped and hiked in Black Bear Country many times with out fear. I have had several bear in counters and all have ended with the bear running away. However I don’t to sound aragonite or foolish, I will be carrying bear spray and a 44 pistol with me. 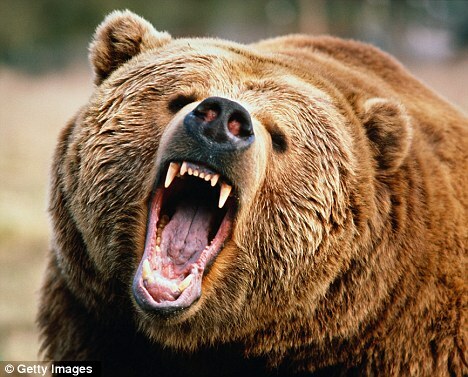 Most Grizzly Bear attacks happen to solo hikers. So rule number one is don’t go alone, take a friend. That is a hard rule for me because I do like to explore on my own. I think me and Keith have the same adventure spirit and we can explore together. Bears don’t like to be surprised, so a group will make more noise than a solo hiker. Rule number two, don’t hike alone, take lots of friends . So that’s two rules I don’t like. If you do come up on a bear and it doesn’t run away. Try to make yourself look bigger. Raze your arms over your head. Hold your jacket out to make yourself look bigger. Do not turn and run. Back away slowly. We will be on horseback and will look bigger. So rule three is don’t hike alone, take a horse. If you are charged by a bear, throw something at it. I prefer lead. So rule four is don’t hike alone, carry a big gun. There have been reports of men killed by bear after unloading all their rounds into the bear from a small calaber handgun. If the bear gets through all the lead and spray, and you can’t get away, cover your head and curl up in a ball. Then hope your budy is a good shot. Rule five is don’t hike alone, take a marksman with you. So I will be going everywhere on horseback with someone out of the group, they are all good marksman. Along with the Grizzly Bears are the Mountain Lions. I don’t know the concentration of lions but they are also a concern. They will stalk you and attack from behind and above. I think the same five rules for Grizzlies will apply for Lions. Next on the list would be Black Bear, Wolfs, Wolverine and and maybe a Badger. Not really much to worry about. There are no poisonous snacks in the Bob. I think we will have to be more careful about slips and falls than the wildlife. The original plan was to enter the Bob at the Meadow Creek Trailhead and camp at the influx of the Black Bear Creek and the South Fork of the Flathead River. The Bear Creek Wildfire put an end to that. From what I can tell on map, the entire area we would have been hunting, camping and fishing in was buried. The trailhead most definitely burned. Even if that area was opened back up, the hunting would be terrible. With nothing to eat, the wildlife that was puhed out will not return this year. A new hunting area is needed. See post “It’s Going To Get Western ” for the rest of the story.